Our client contacted us directly as they were having a new kitchen installed and were very interested in our illuminated splashbacks. 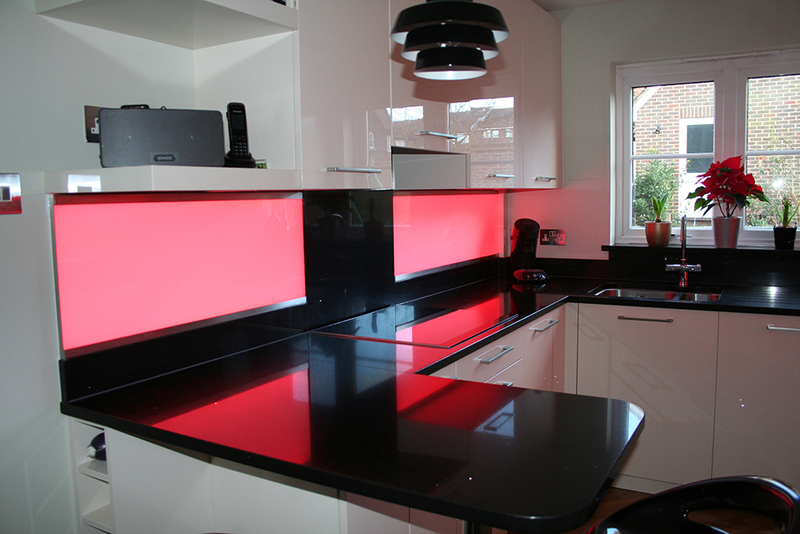 However, instead of having the splashbacks at full height, they wanted the splashbacks to be designed in the style of an upstand. 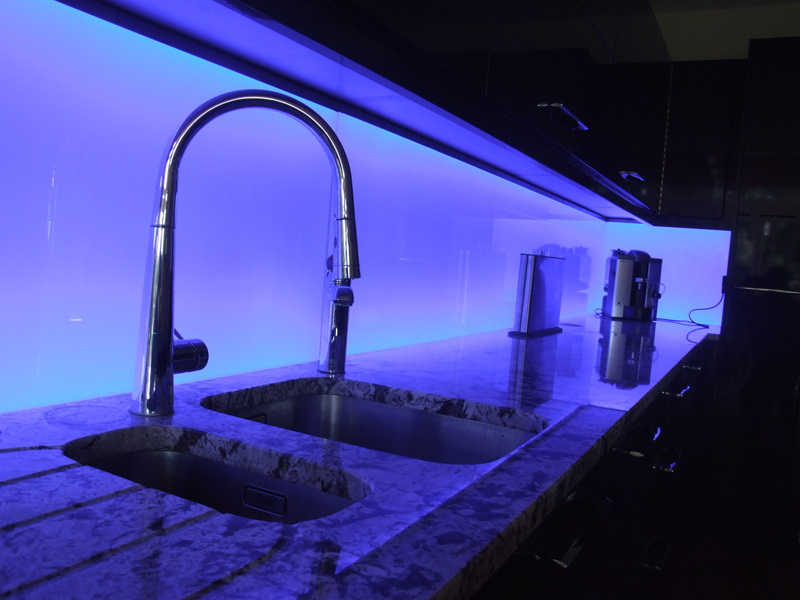 Following several conversations and emails regarding the height and quantity of splashbacks, our client placed their order and we produced drawings of each illuminated panel and sent them to our client for each one to be singed off prior to production. 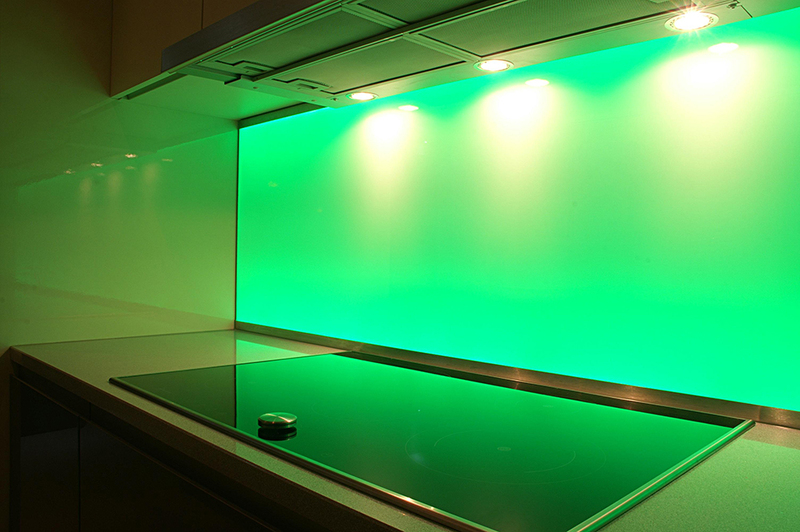 These six illuminated splashbacks/upstands have colour-changing LEDs in them and have brushed stainless steel frames around them. 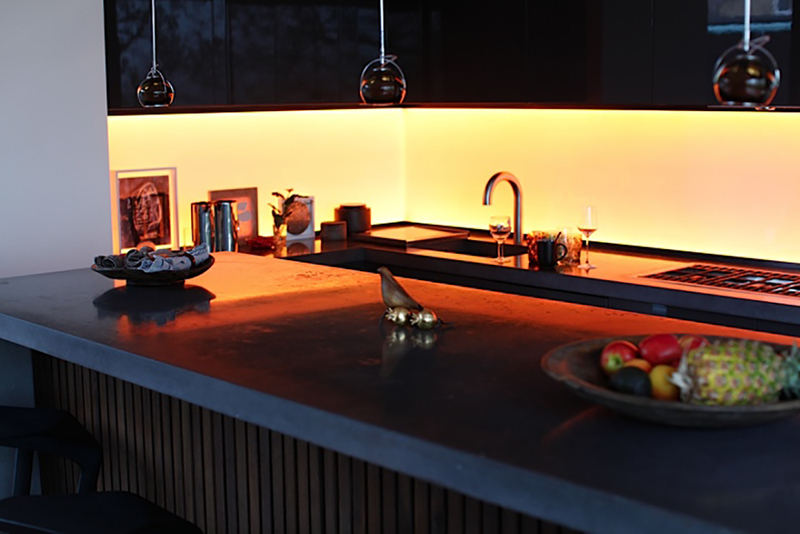 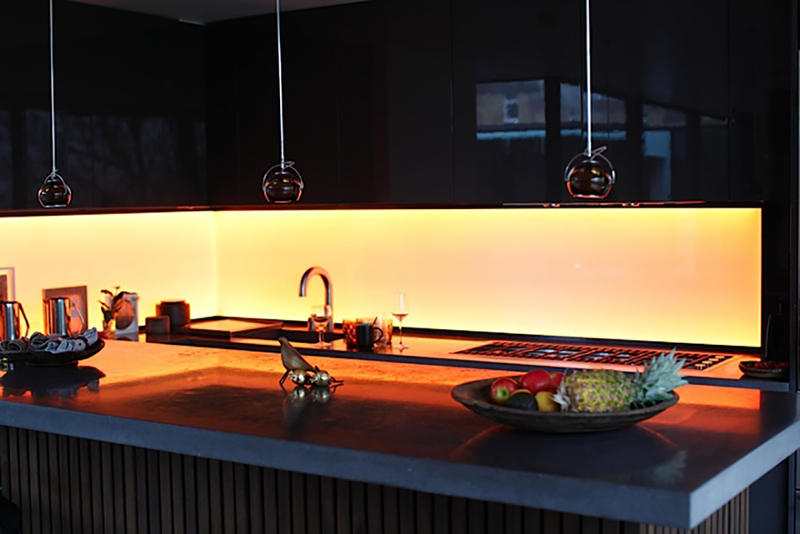 Using our LiteTiles as an upstand instead of a traditional splashback acts as a unique feature in this kitchen – as well as providing excellent lighting. 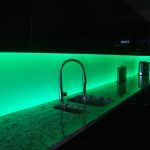 Our client contacted us via the contact form on our website as they were having a new kitchen installed and were very interested in our illuminated splashbacks. 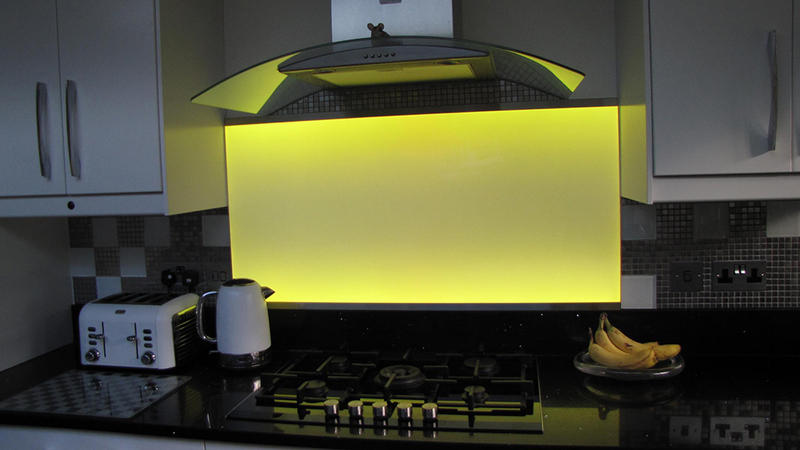 We provided a quote for 4 illuminated splashbacks – including one with a socket cut-out and another with an angled edge to it. 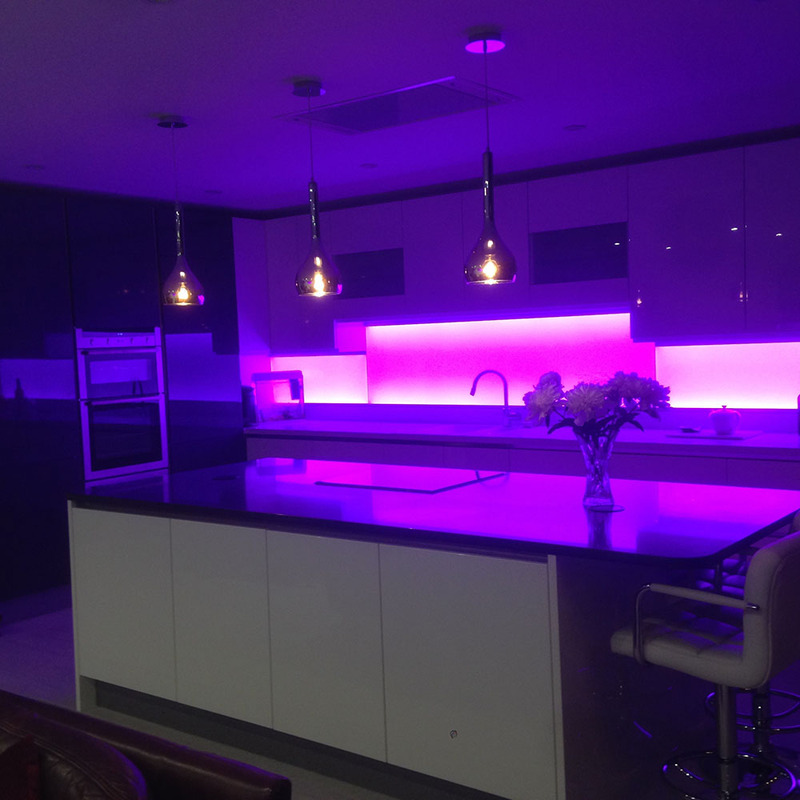 After several discussions about the best way to do this, our client placed the order and we produced these lovely splashbacks. 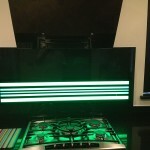 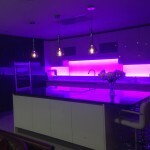 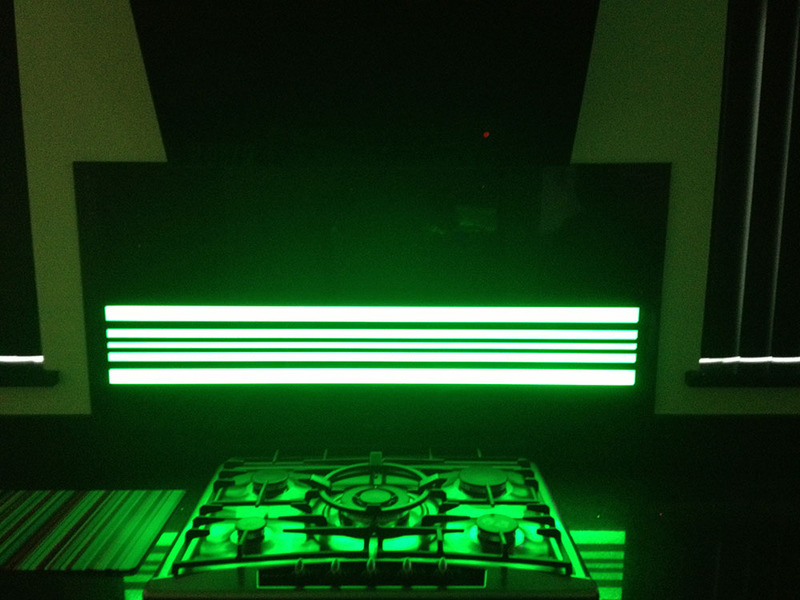 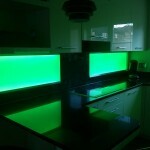 These splashbacks have colour-changing LEDs in them and our client has said “I love my splashbacks!”. 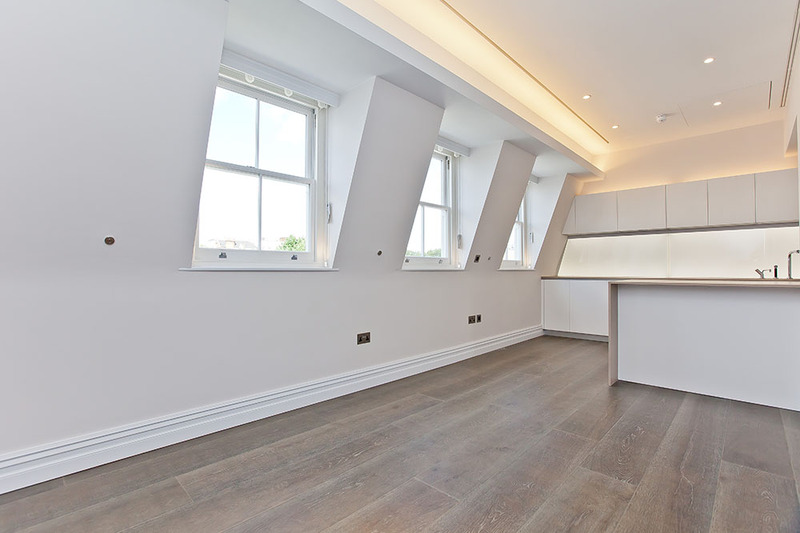 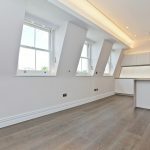 This project consisted of the conversion of a grade-II listed hotel near the Royal Albert Hall in London into 18 luxury apartments and two mews houses. 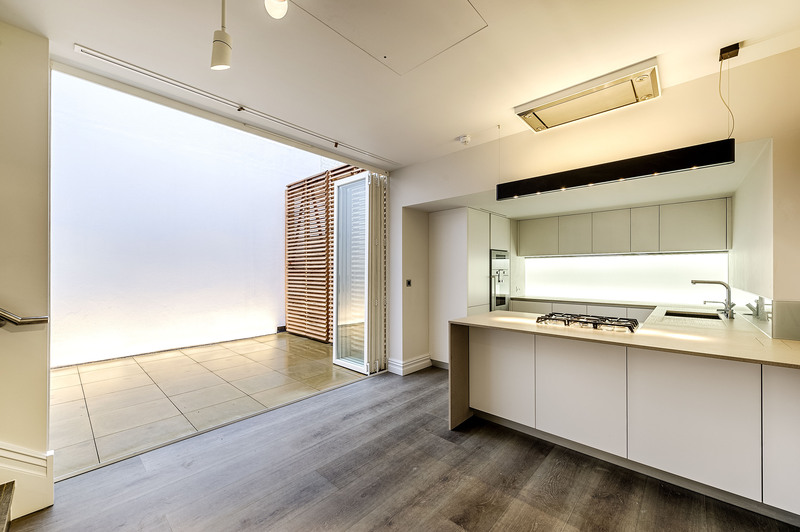 The development was formed within the existing seven-storey building façade. 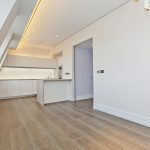 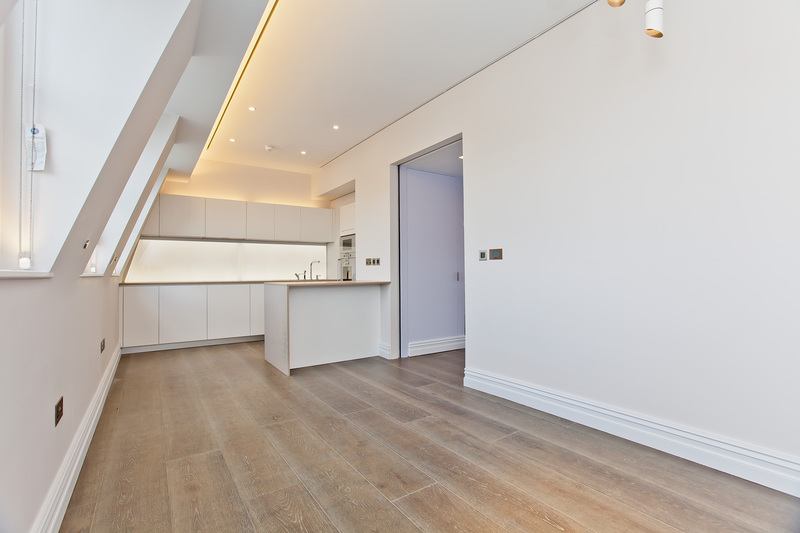 The project also included the refurbishment and extension of existing mews houses located behind the hotel into luxury three-bedroom, two-storey mews houses. 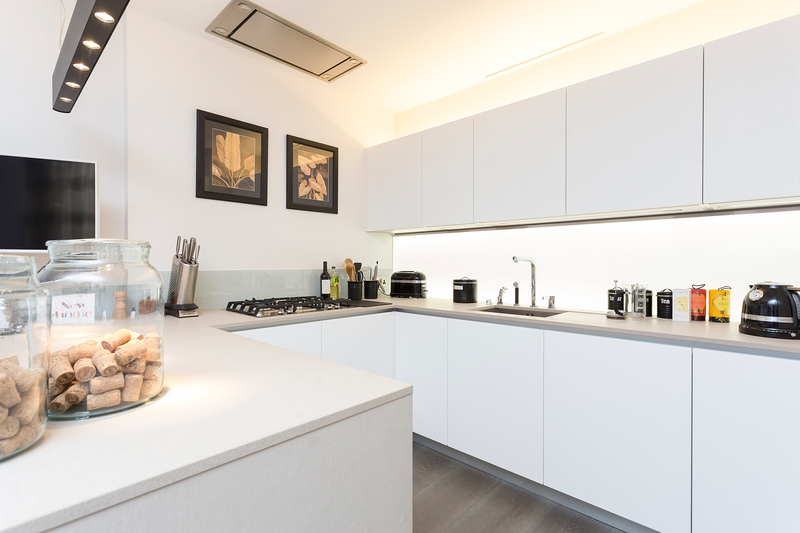 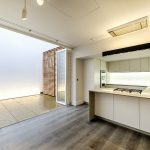 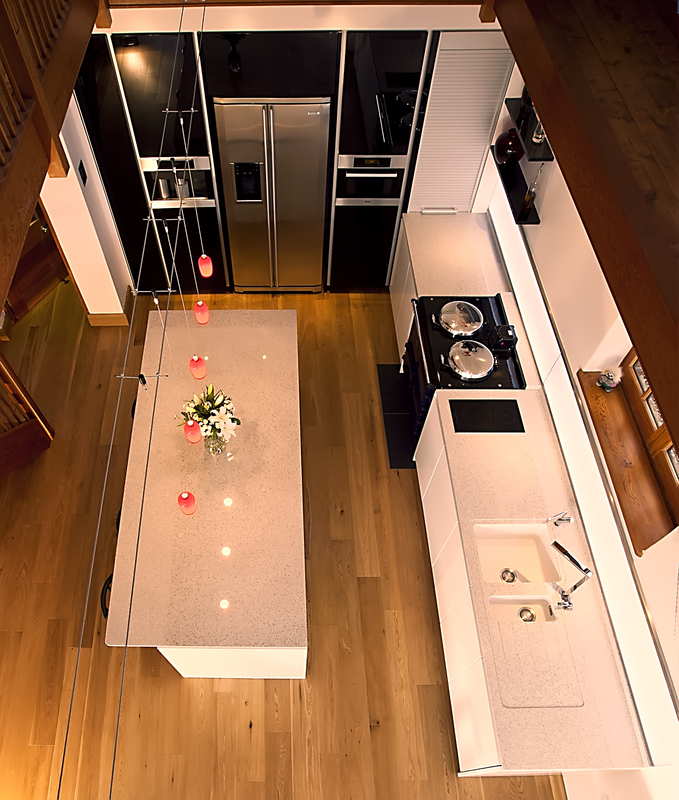 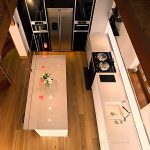 The architect contacted us as the designer wanted the interiors of these apartments and mews houses to have modern appliances and high-end finishes throughout and the designer thought that illuminated splashbacks met that criteria. 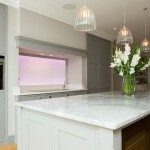 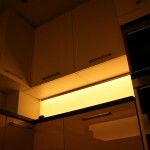 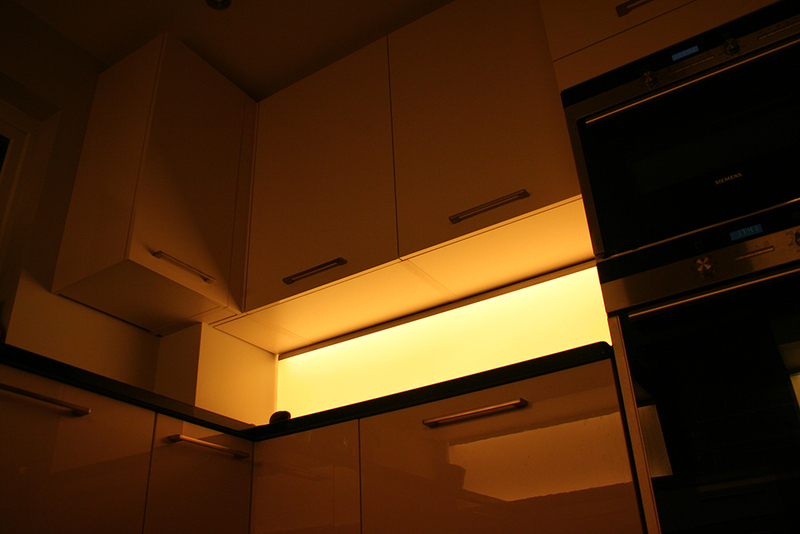 All the kitchen cabinetry is white and the designer wanted the splashbacks to be illuminated with white-only LEDs. 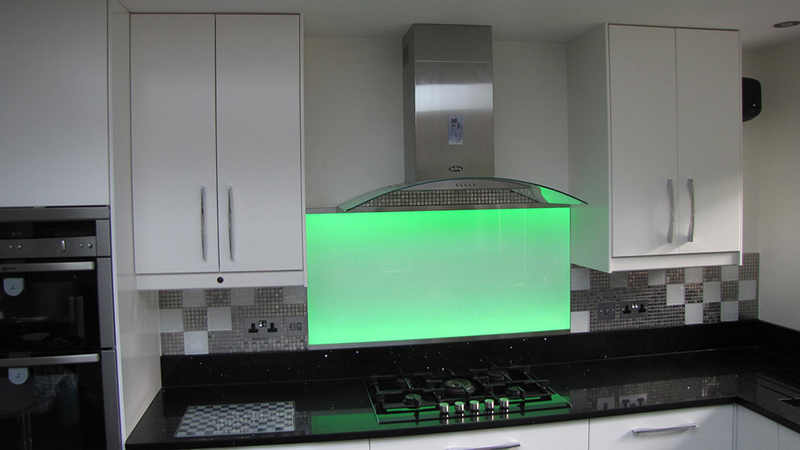 Following several site meetings and surveys, we produced the splashbacks for this development – some of which had to have additional design work carried out on them as they had to fit into the eaves of the building. 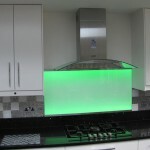 As the splashbacks just have white LEDs in them there is no need for a colour control unit and the splashbacks are switched on and off via the main electrical circuit in each apartment or mews house. 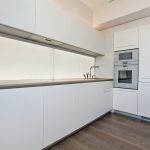 Installation was carried out by a two-man team over quite a period of time as there were considerable delays with the refurbishment, but the end result is a cool, calm effect in these high-end residences and these images show the splashbacks in both occupied and unoccupied apartments. 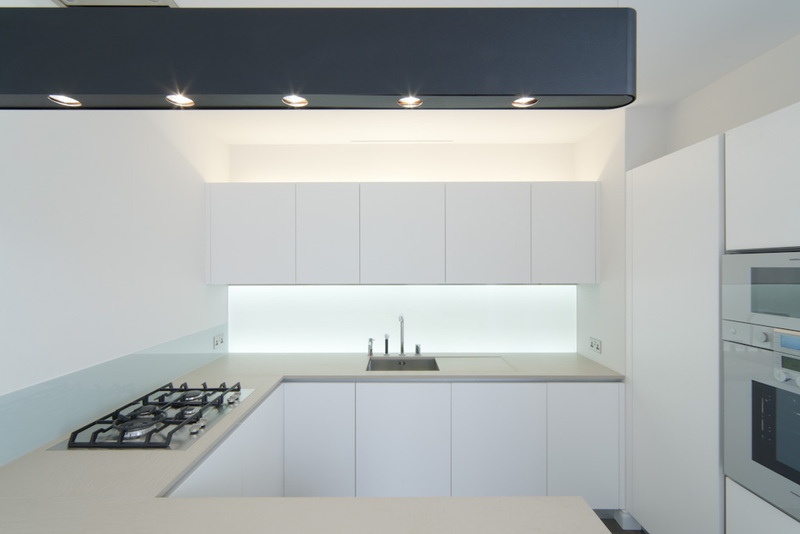 A London-based construction company contacted us as their client was building a new family home within a conservation area of an award winning 1960’s development in North London. 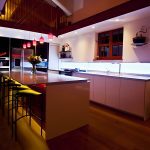 Their client wanted to create an additional bedroom, bathroom, study, guest room and external deck and provide a practical back yard that could be enjoyed with improved access from the house. 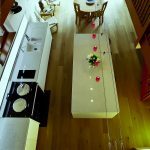 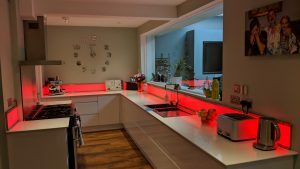 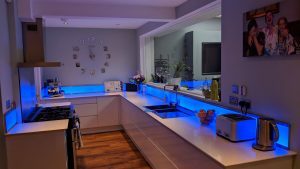 Their client also wanted something innovative, different and energy-efficient in their new kitchen and originally we were asked to quote for two splashbacks with just white LEDs. 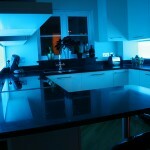 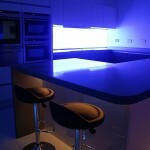 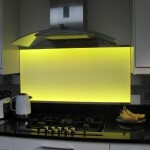 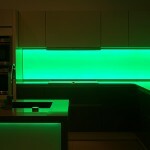 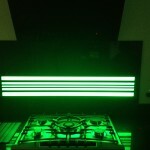 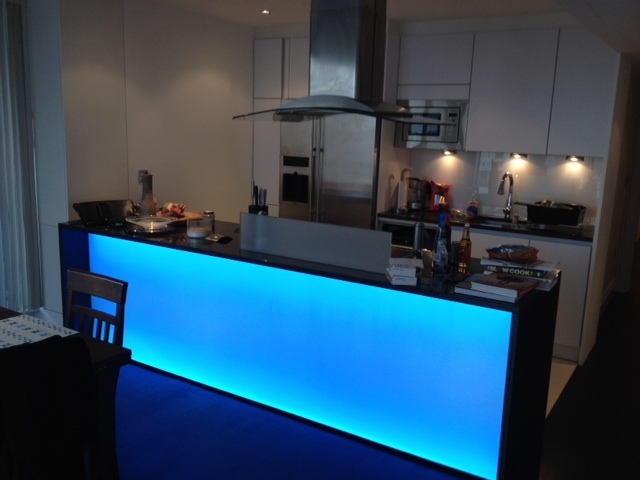 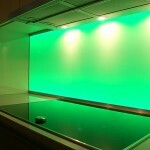 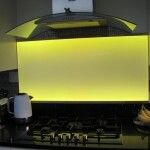 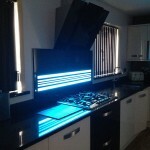 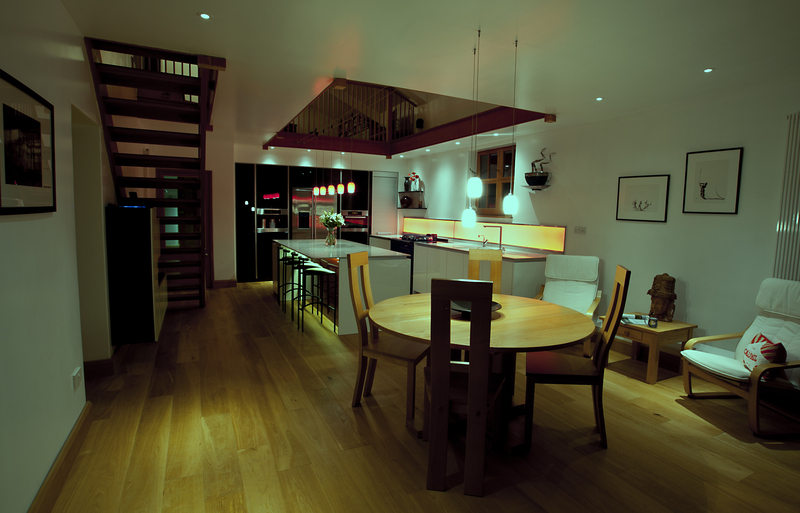 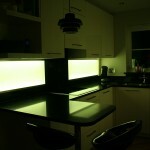 However, they then decided they would like to have two large splashbacks illuminated with colour-changing LEDs. 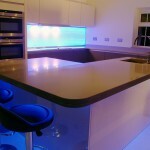 We provided a quote and the client placed the order with us. 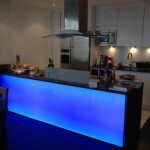 We then produced technical drawings of their order which were signed off and we commenced production of the two splashbacks. 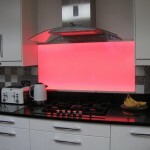 The splashbacks run along two walls and meet in a corner and are controlled by an infra-red control unit. 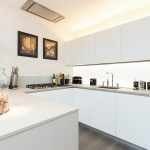 Instead of having just brushed stainless steel frames around the splashbacks, the home owners decided to have the frames painted white to match other surfaces in their new kitchen. (Our frames can be painted to match any RAL or Pantone colour if requried). 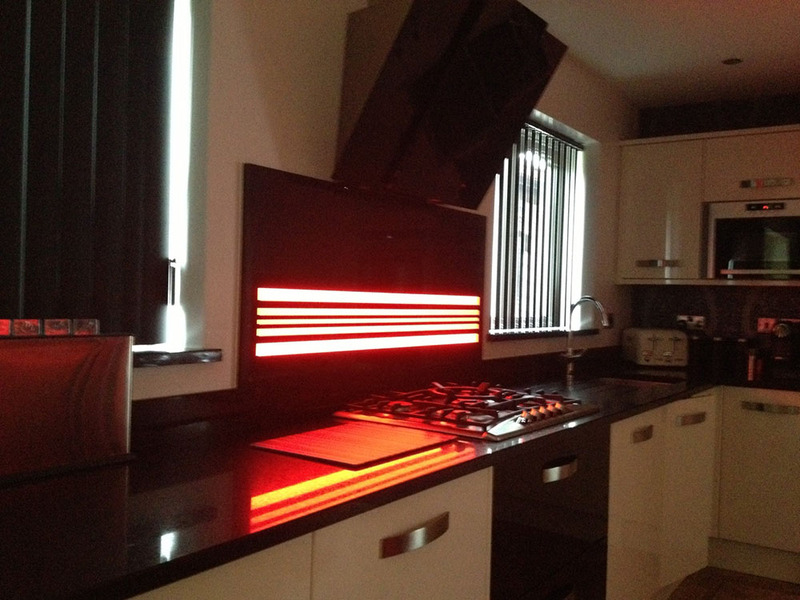 The home owners are delighted with their LiteTile splashbacks and sent us these lovely images. They told us that when the splashbacks are set on green their children call them Shrek and when they are set on blue they are called Tron! 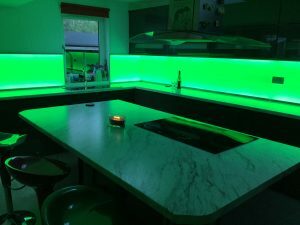 Devon-based kitchen company, Roomers, were asked to contact us by their client as he wanted a LiteTile splashback to run along the wall behind his range and sink in his new kitchen. 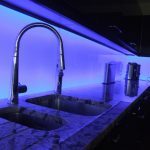 Following our visit to Roomers showroom in Exmouth to discuss this project in greater detail, they spoke to the client and explained all about our LiteTile splashbacks. We then provided a quote for two splashbacks as the length involved (over 4m) meant that we had to produce two units (this is because the single longest splashback we can produce is 3m). 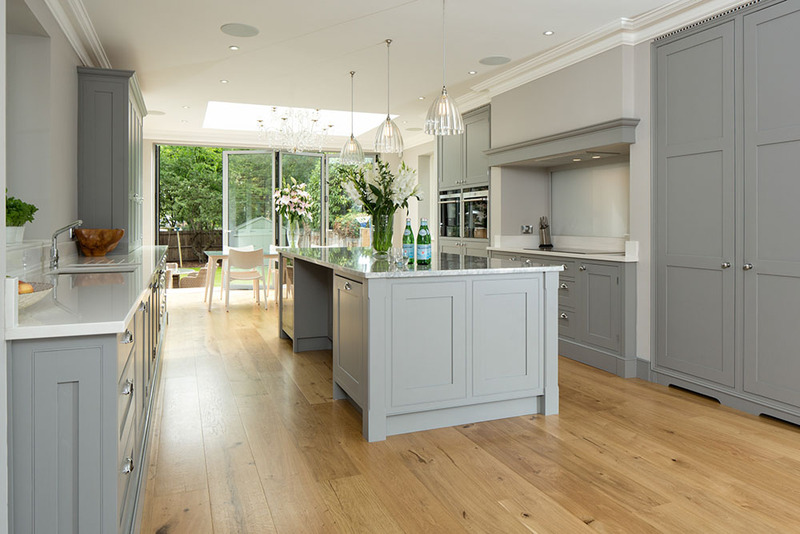 The images (kindly taken by our client) shows the splashbacks neatly installed in this lovely kitchen with the stainless steel frames fitting in very well with the grey/white cabinetry and the grey worktops and are just the right finishing touch to this kitchen. 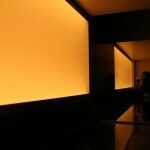 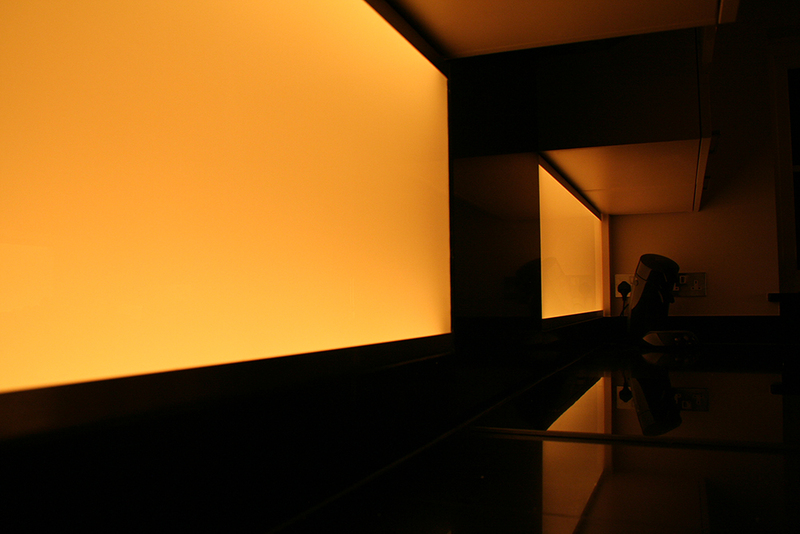 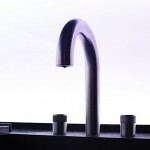 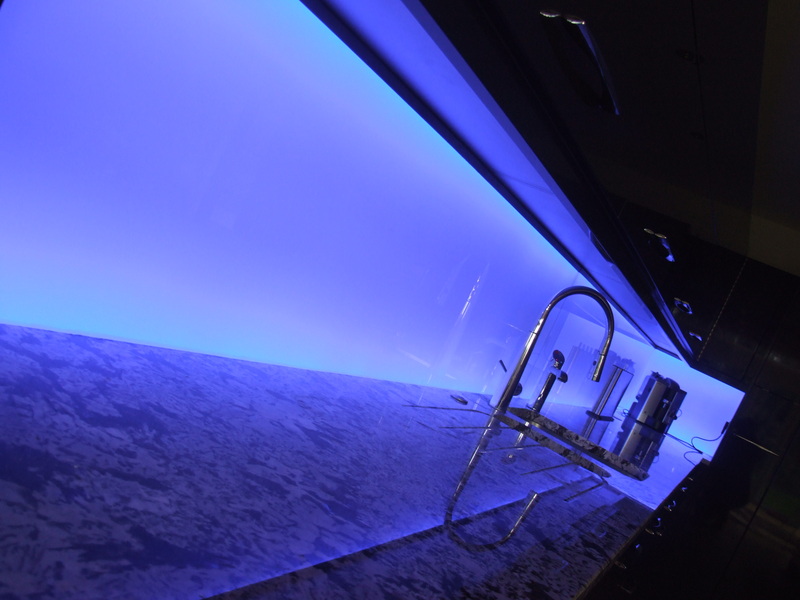 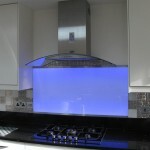 The splashbacks have colour-changing LEDs in them and are controlled by an infra-red remote colour control unit. 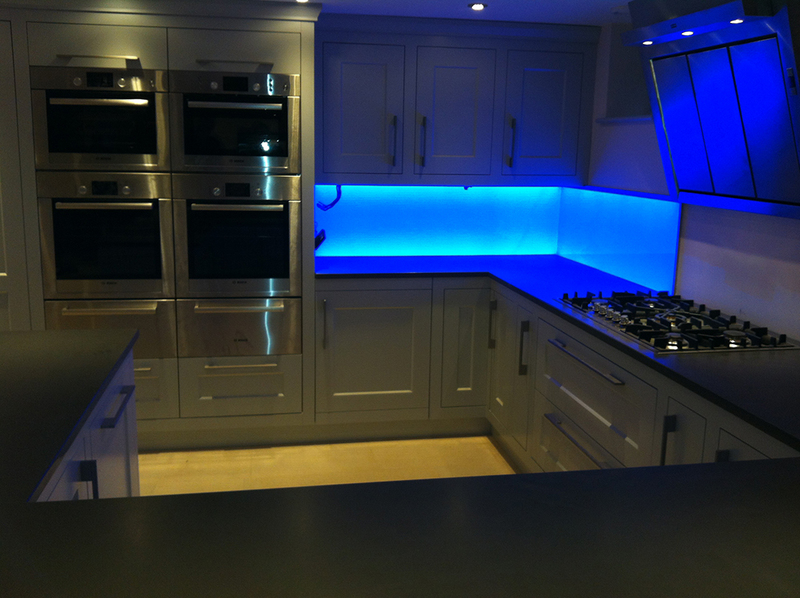 We were asked to assist Berkshire-based kitchen company Maple & Gray whose client wanted an illuminated splashback in their new kitchen. 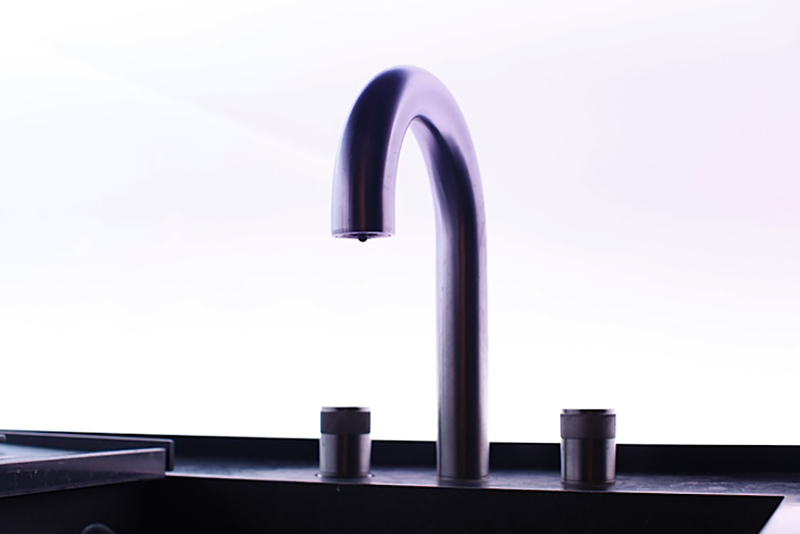 Maple & Gray were not familiar with our product so we explained the product, its design, its funtionality and the ordering process to them. 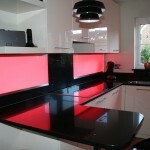 They have told us that they found installation easy and that the end result is exactly what their client envisaged. 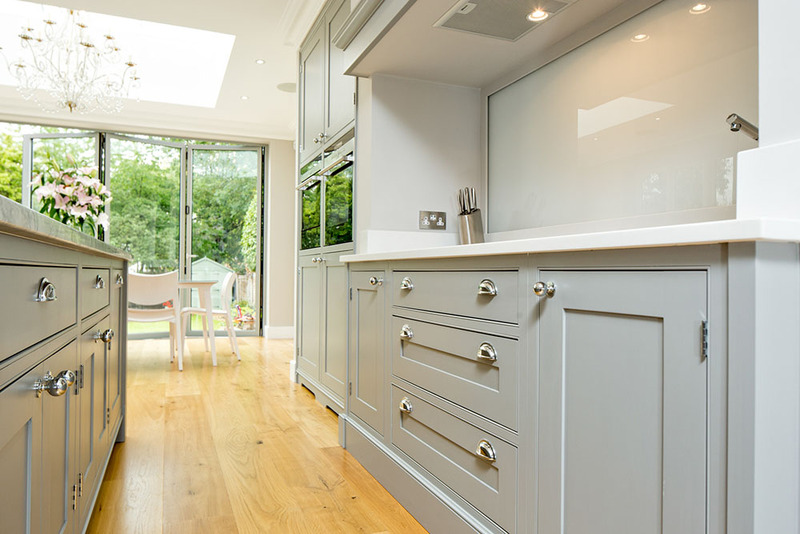 Maple and Gray kindly shared these photos with us and they show that a LiteTile splashback fits perfectly into a traditional kitchen and the colour of the kitchen units compliment the colours the LiteTile splashback can produce perfectly. 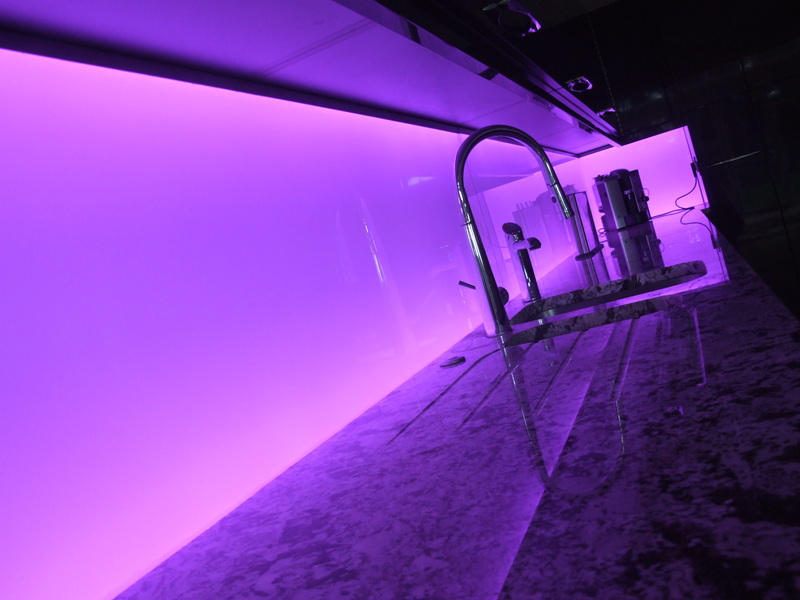 We were asked to assist kitchen company Custom, based on the Isle of Wight – they were installing a modern kitchen into their client’s house and told us “With lighting and atmosphere an integral part of our dseign we needed to find something that was both impressive and unique.” We installed one single LiteTile spalshback on the wall behind the hob and worktop – and as can be seen, the lights that are in the extractor fan aren’t really needed as the LiteTile produces such a good light! 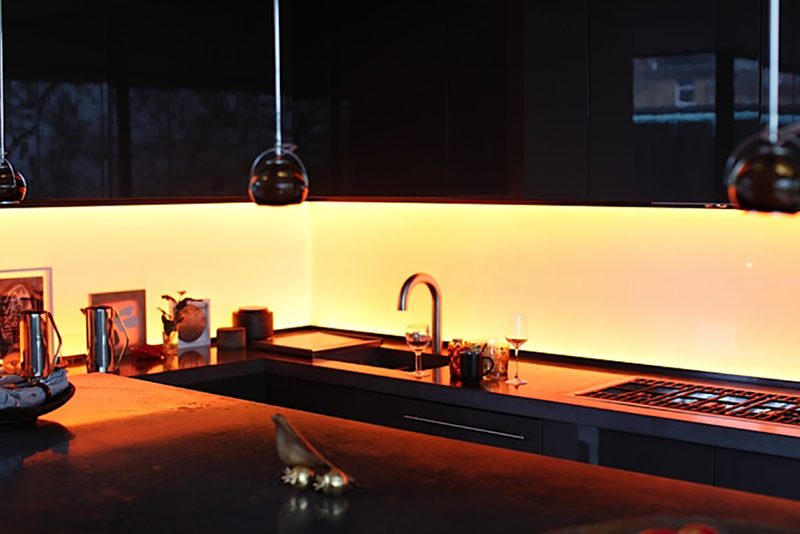 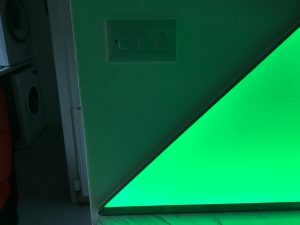 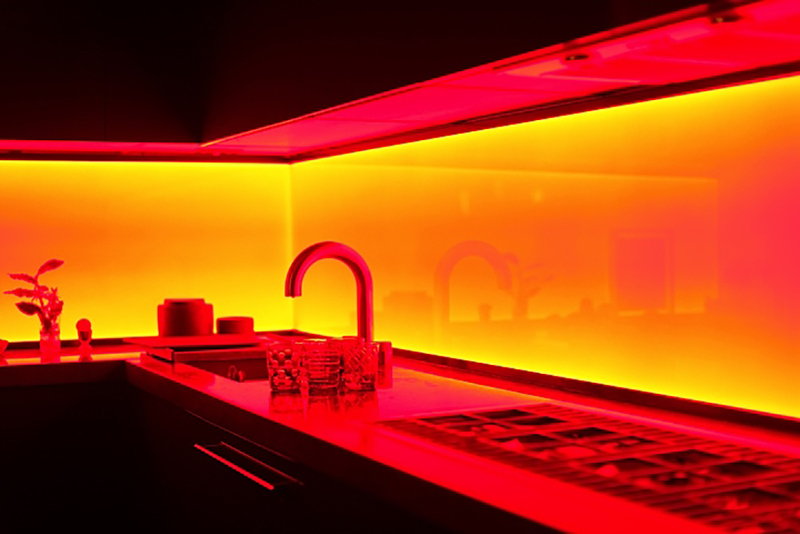 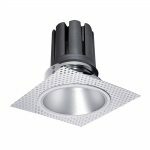 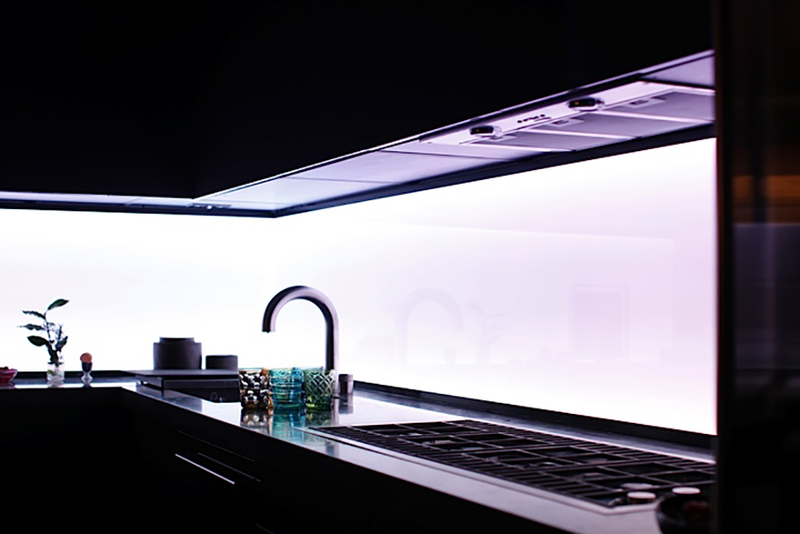 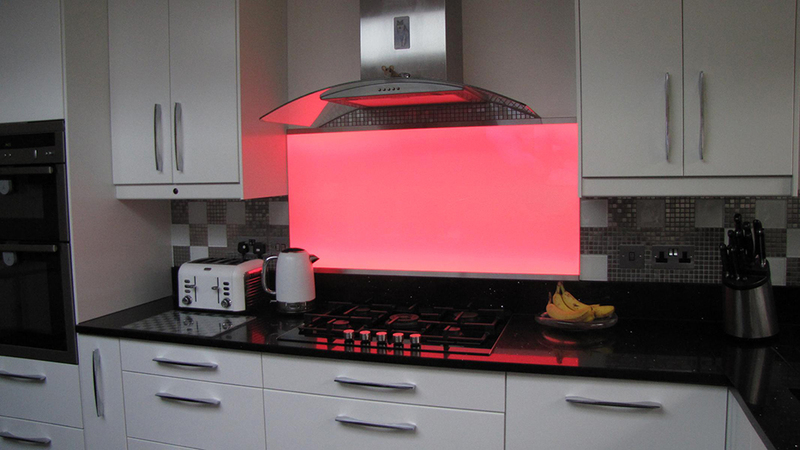 This splashback has colour-changing LEDs in it and is controlled via an infra-red colour control unit and the infra-red “eye” is installed in the kickstrip. 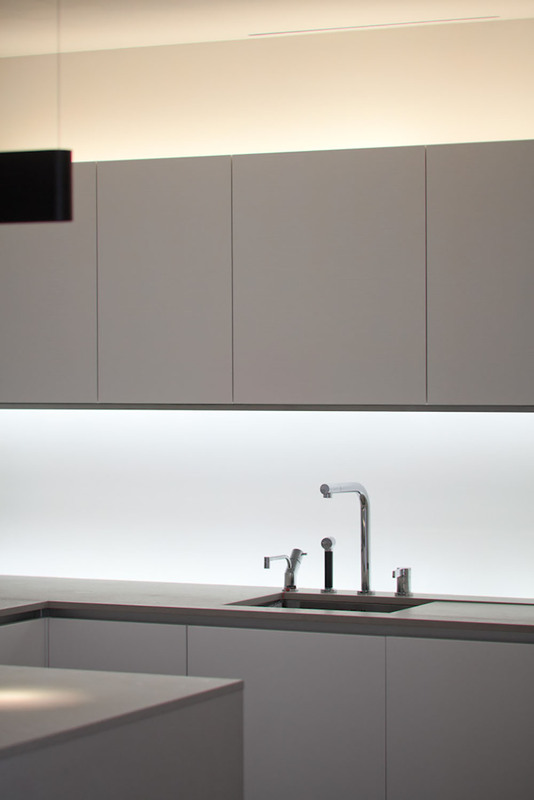 After installation, Custom told us “The effect of the LiteTile splashback has been nothing short of stunning – the splashback’s ability to completely change the mood of the kitchen exceeded both our and our client’s expectations”. 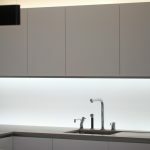 Custom’s client is delighted with the LiteTile splashback as they have a very minimalist, contemporary kitchen and feel that the splashback compliments this very well and provides an eye-catching feature which has become a focal point of the ktichen. 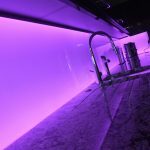 We were delighted to work with Custom to achieve this effect and are very happy to installed the first LiteTile spalshhback on the Isle of Wight. 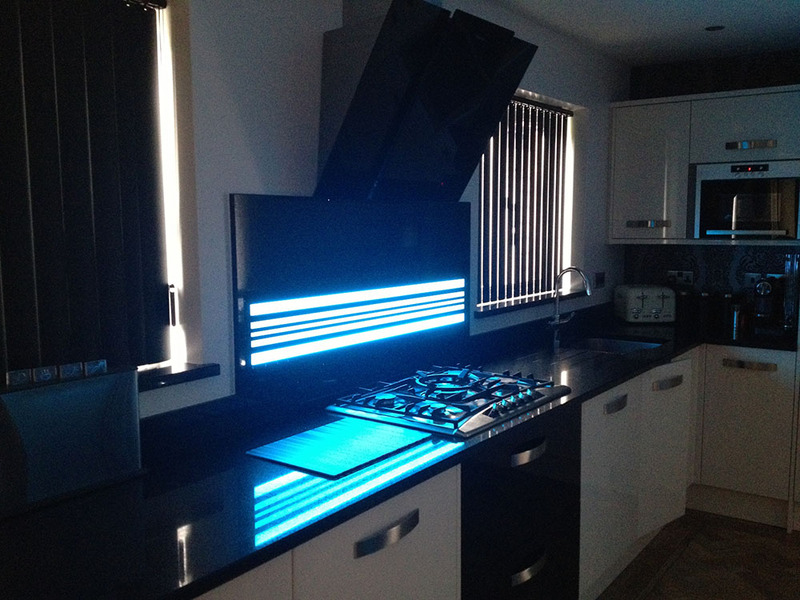 Our client had seen a striped illuminated splashback in a well known national store but upon enquiry he was told that he was unable to purchase the splashback on its own. 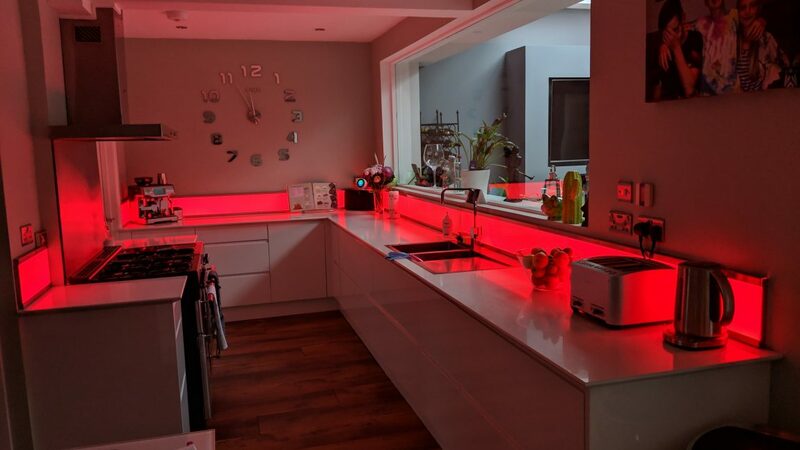 He spent some time looking on the internet for a company who could help him and so he approached us to see if we could re-create the same effect. 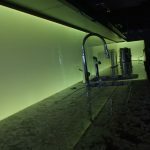 The original design that our client had seen in the store was a piece of glass, stood away from the wall on batons with LED strips pointing up and down to give a certain amount of illumination behind the glass. 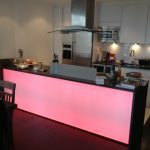 After several discussions, we explained to our client that we would be able to take this initial concept to the next level. 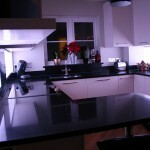 We provided a quote and an order was placed. 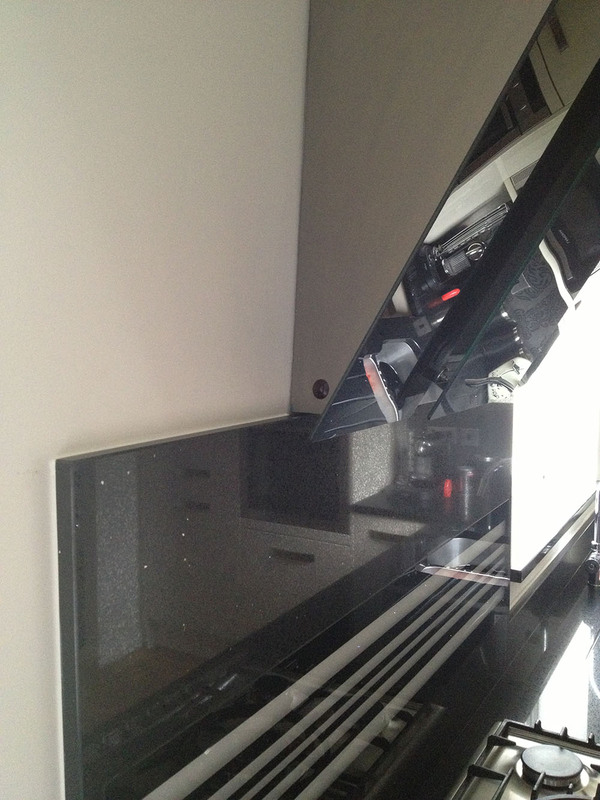 This splashback was produced by having a piece of glass flood coated in black vinyl and then lasered to remove the strips. 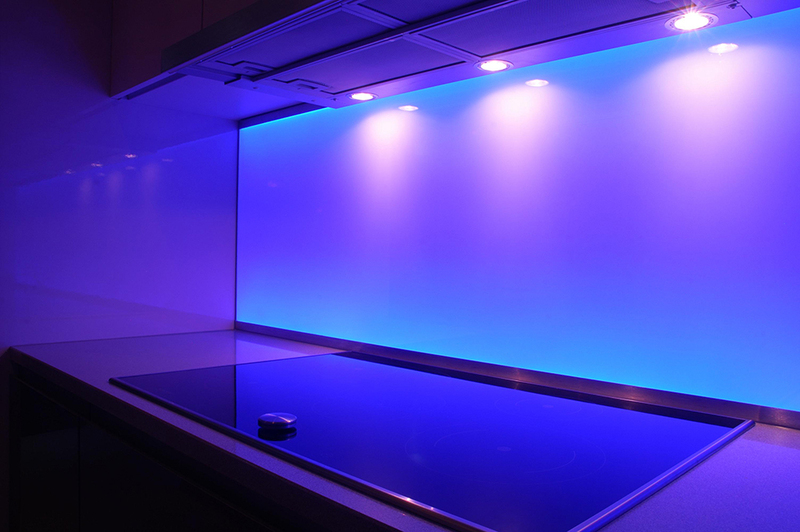 This piece of glass was then back illuminated using Prismex and colour-changing LEDs. 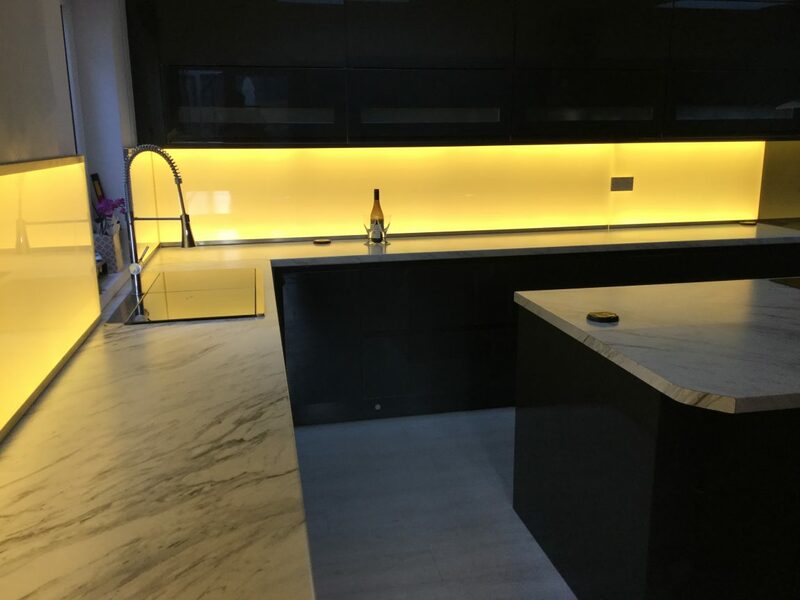 We worked very closely with the client in order to get the result he wanted and this resulted in him having the glass recessed into a granite splashback. 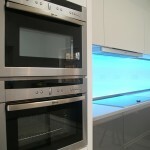 We then supplied the unit as a “kit of parts” which the client was very happy to assemble himself. 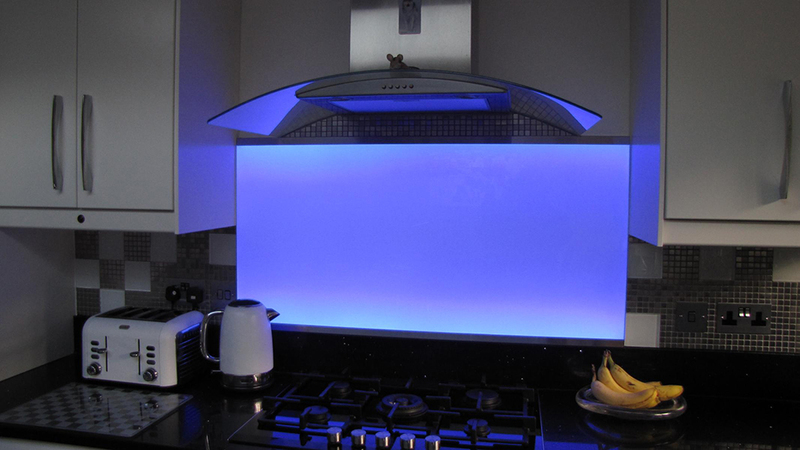 This splashback has colour-changing LEDs in it and is controlled by an infra-red remote control unit which our client has cleverly hidden in the extractor fan hood and he is more than happy with the overall effect that the LiteTile splashback produces. 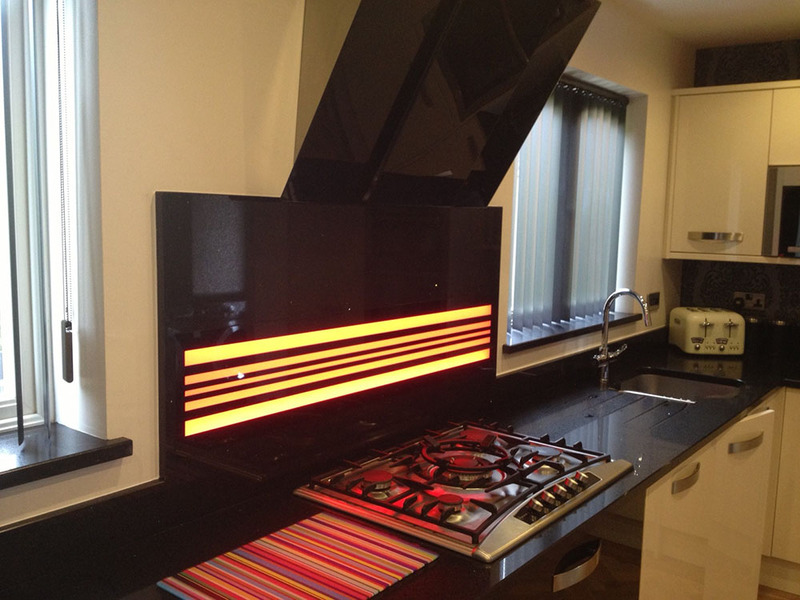 The striped design on this splashback was the client’s own design, but any design could be put on a LiteTile splashback – just contact us if you have an idea about the design you want. 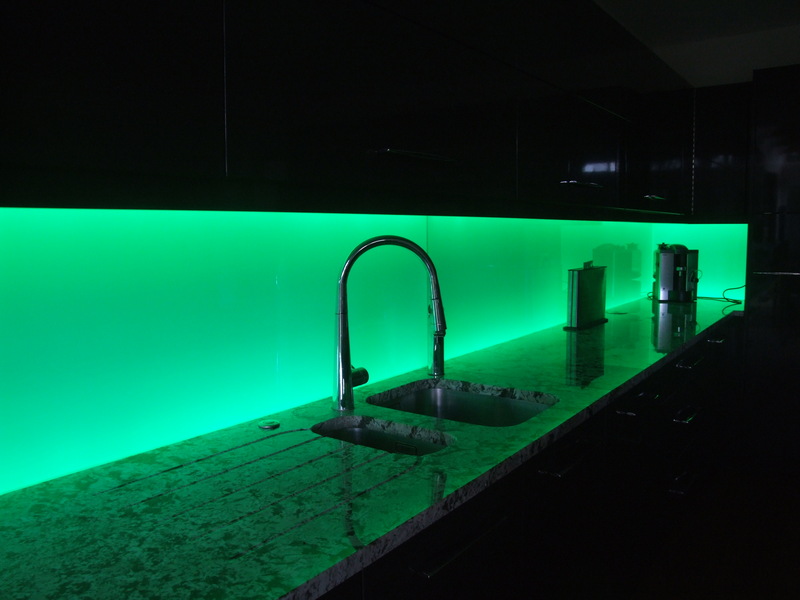 Our client contacted us directly as they were renovating a farmhouse and associated outbuildings in the beautiful Wiltshire countryside and were very interested in our illuminated splashbacks as they thought a LiteTile splashback would provide a cutting-edge feature in their new kitchen. 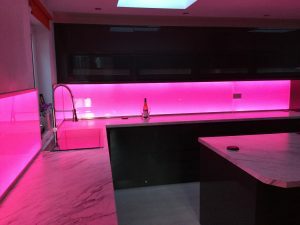 We had a long talk on the telephone about our product and then arranged a site visit as our client was not sure if two or three LiteTile splashbacks would be suitable for their kitchen. 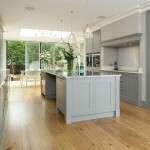 Having visited our client (and being introduced to their wonderful rare breed pigs! 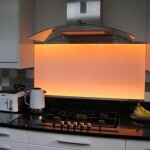 ), we sent our client a quote for just two splashbacks – one along each wall and meeting in a corner. 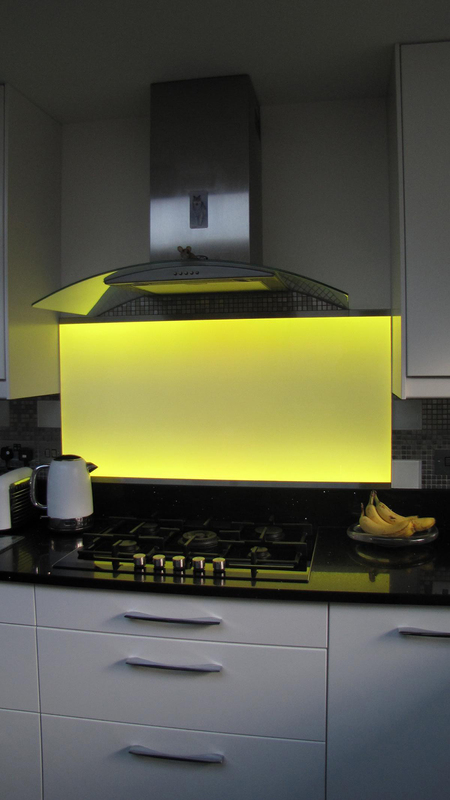 Our client placed an order for the two splashbacks and we sent them three pages of technical drawings to sign off and when we received this sign off, we commenced production of the LiteTiles. 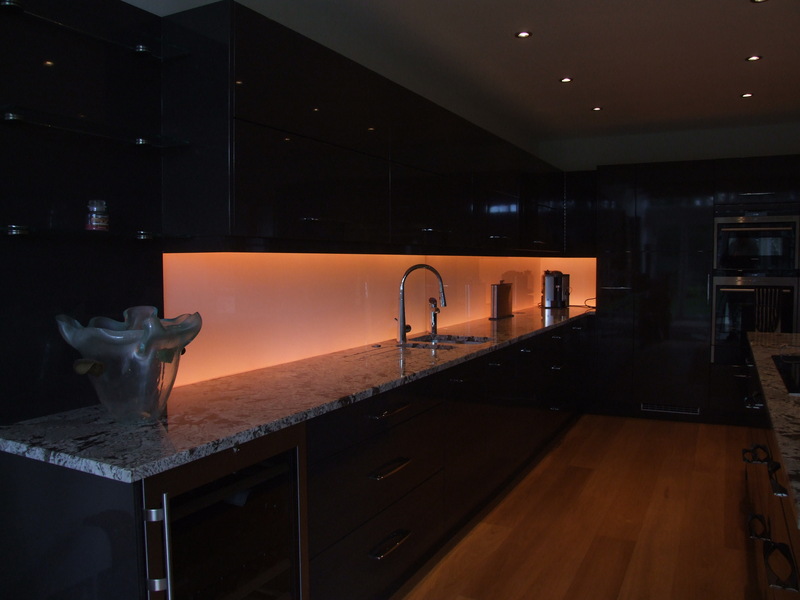 This corner of our client’s kitchen is quite dark so our splashbacks really do add excellent illumination to this part of the room. 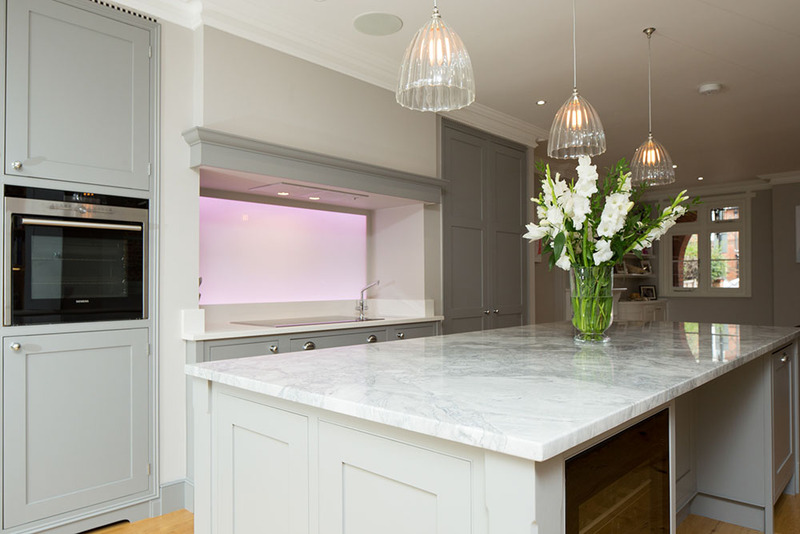 As our client’s new kitchen appliances were all in brushed stainless steel, they decided not to have the splashback frames painted – so everything coordinates beautifully in their new kitchen. 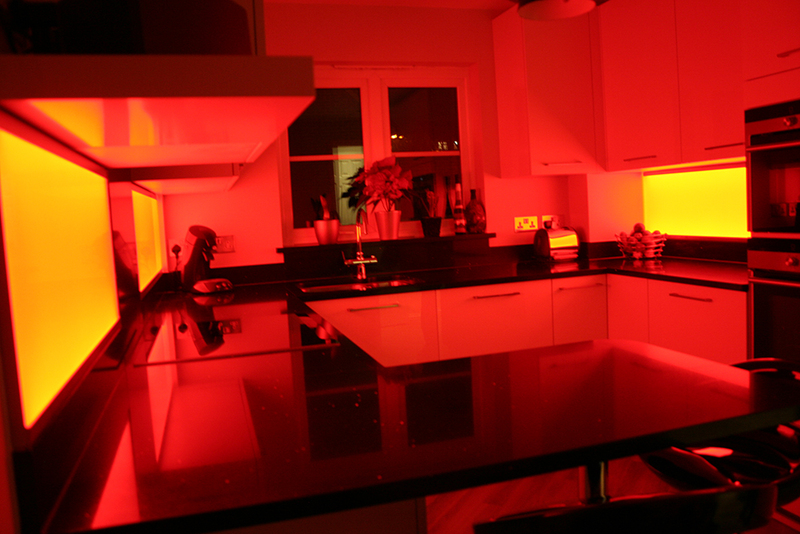 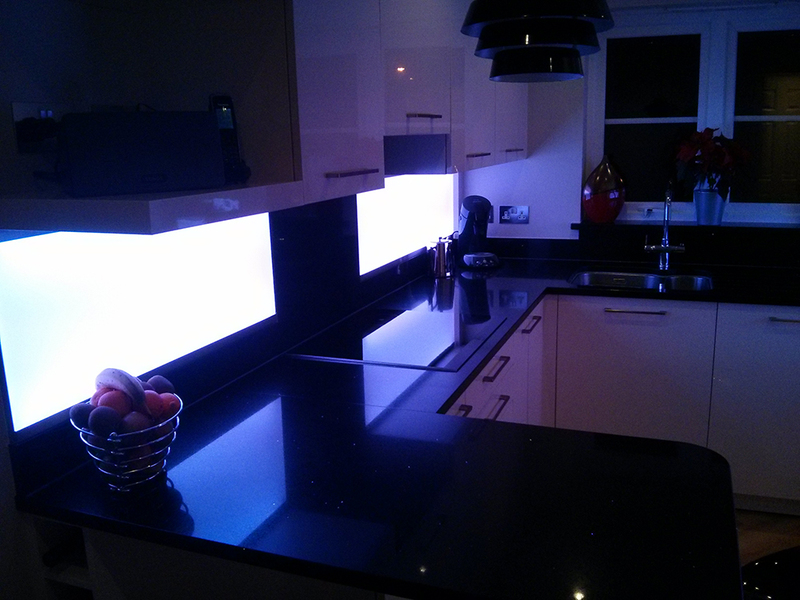 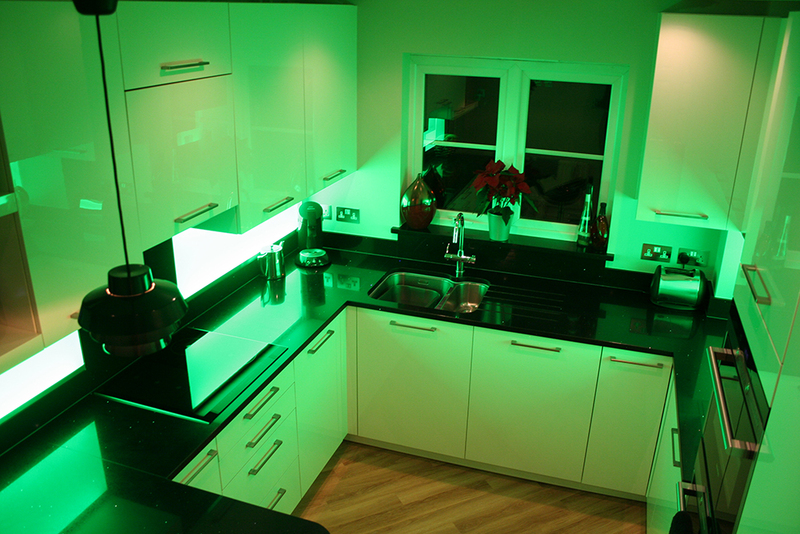 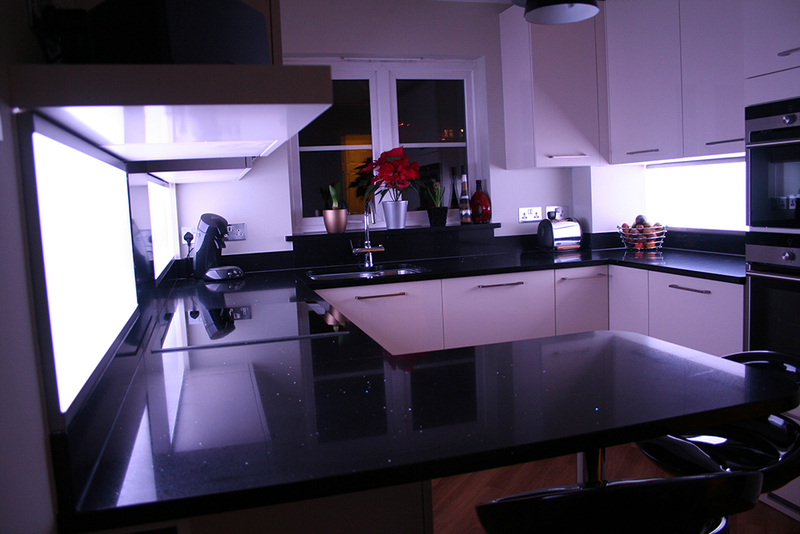 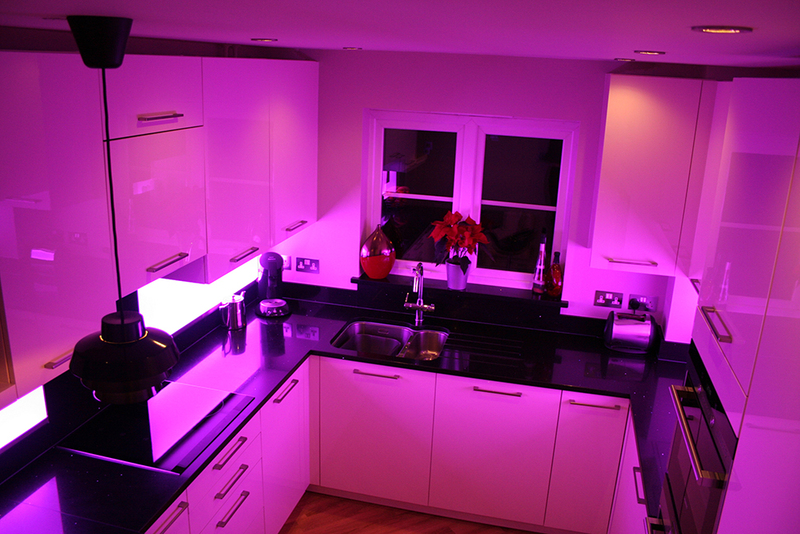 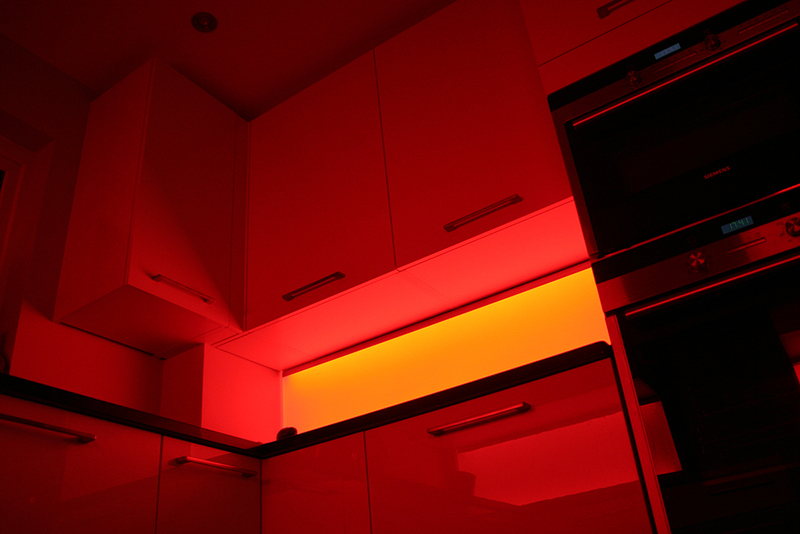 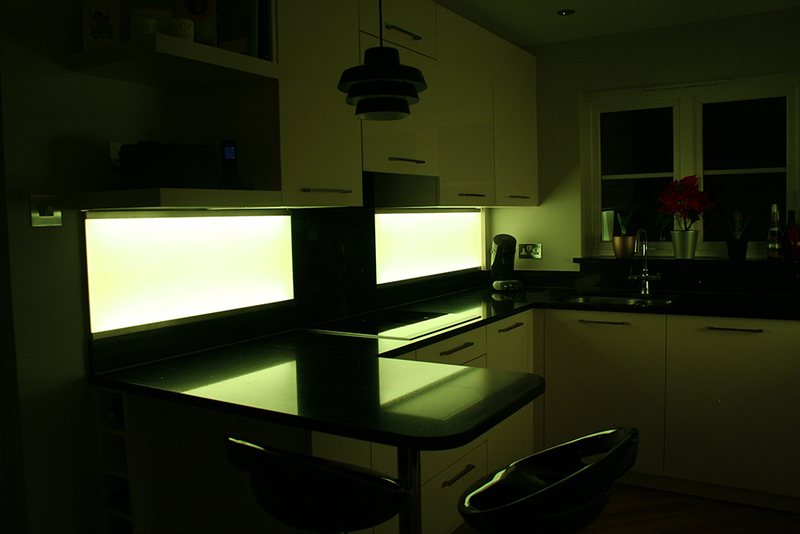 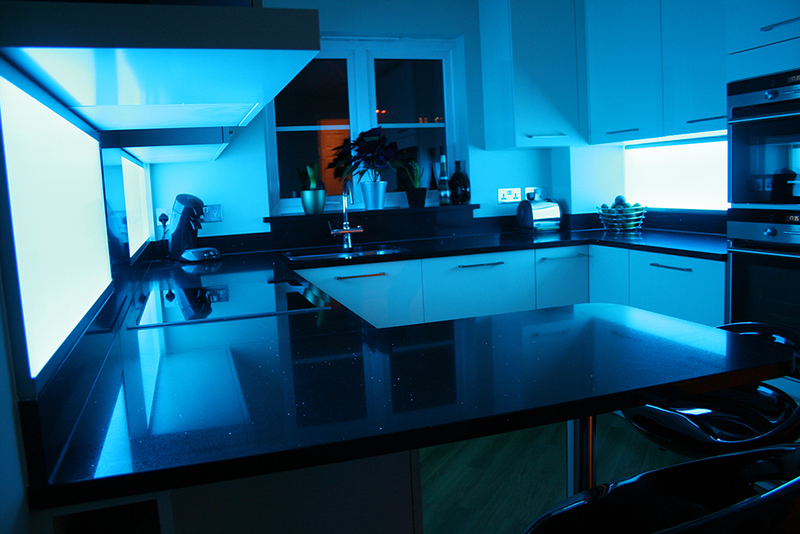 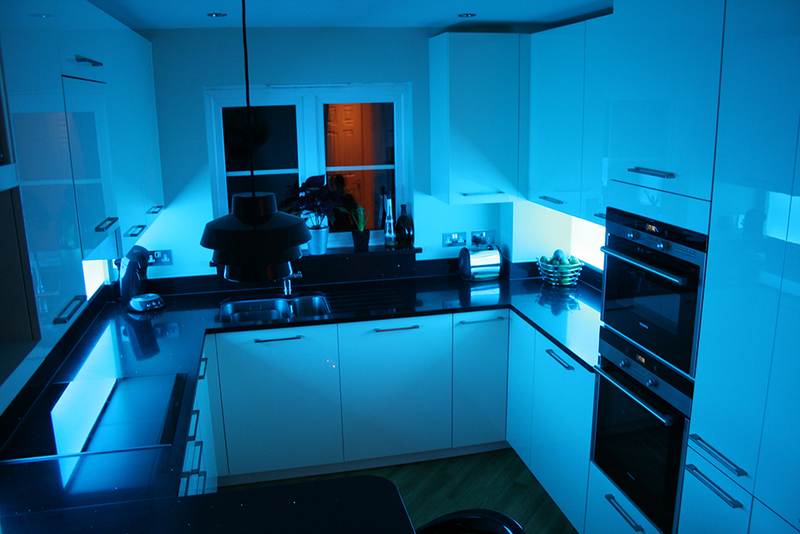 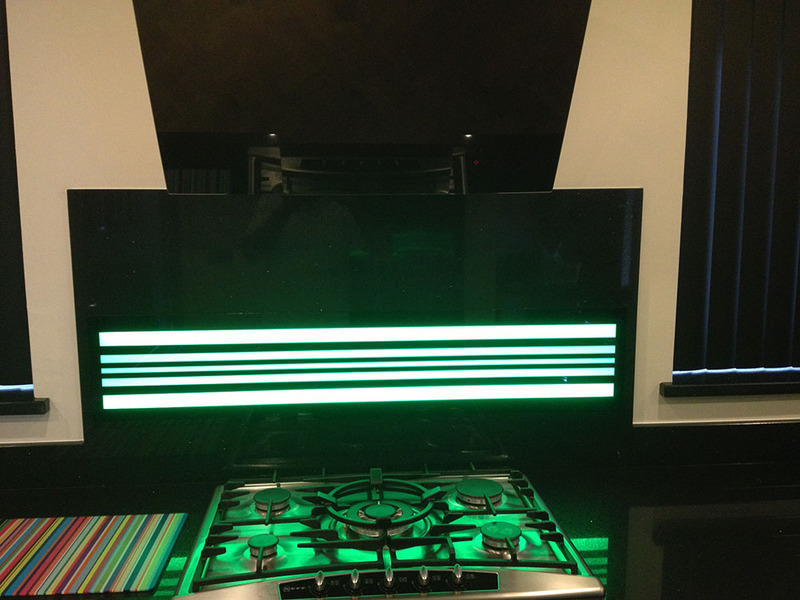 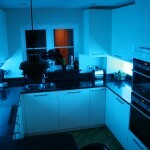 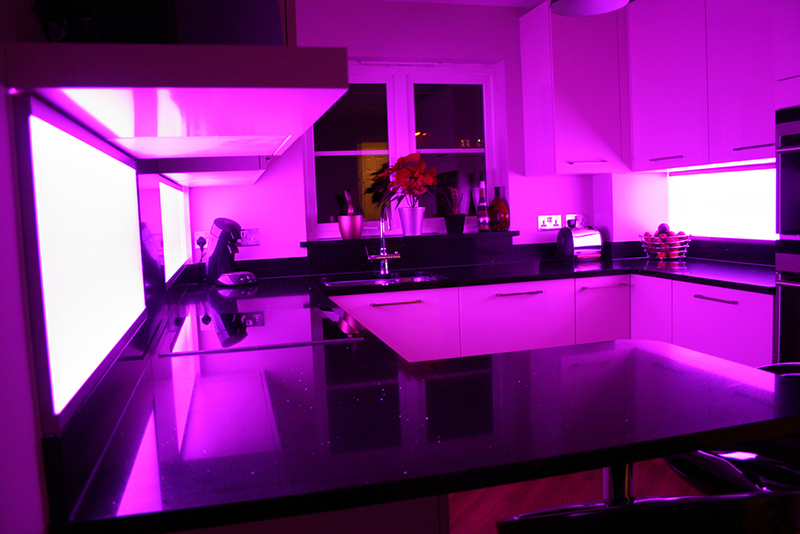 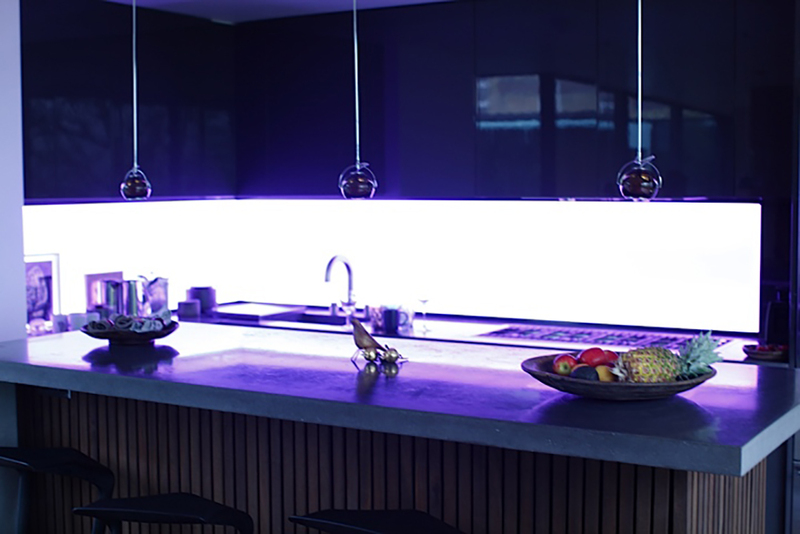 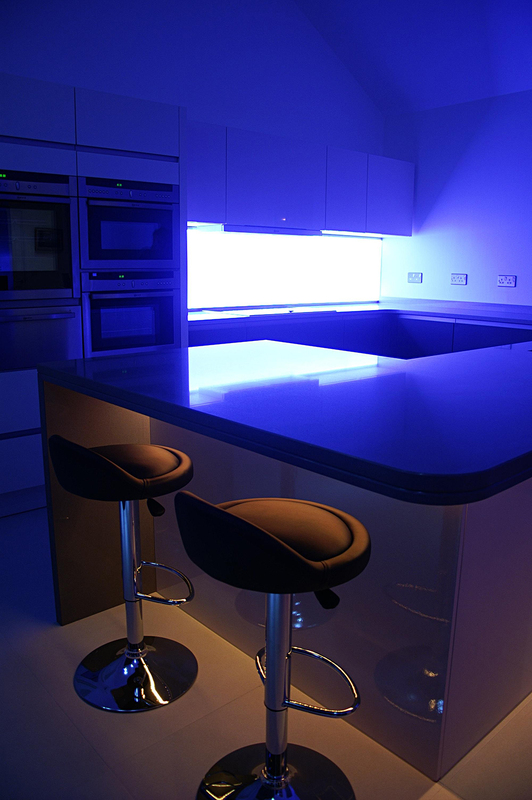 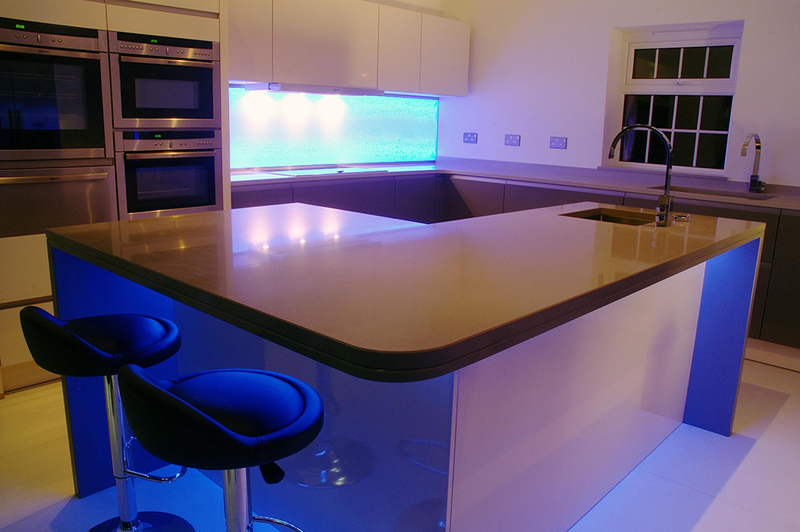 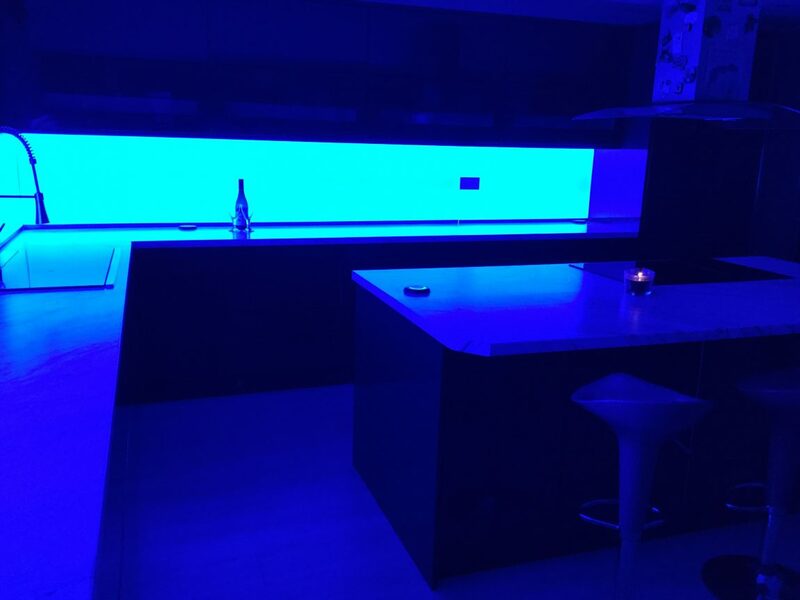 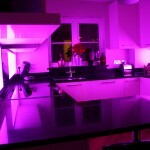 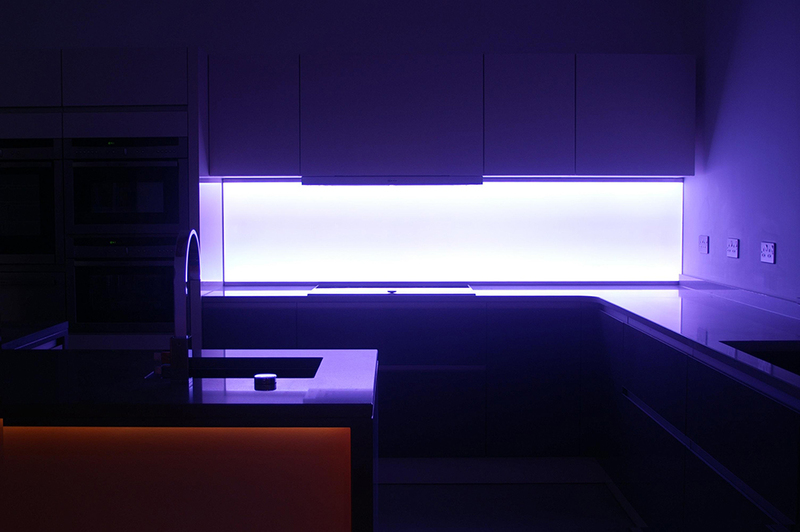 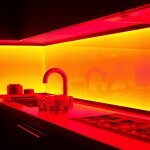 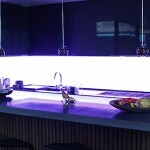 These two splashbacks have colour-changing LEDs in them and they are controlled by an infra-red remote control unit. 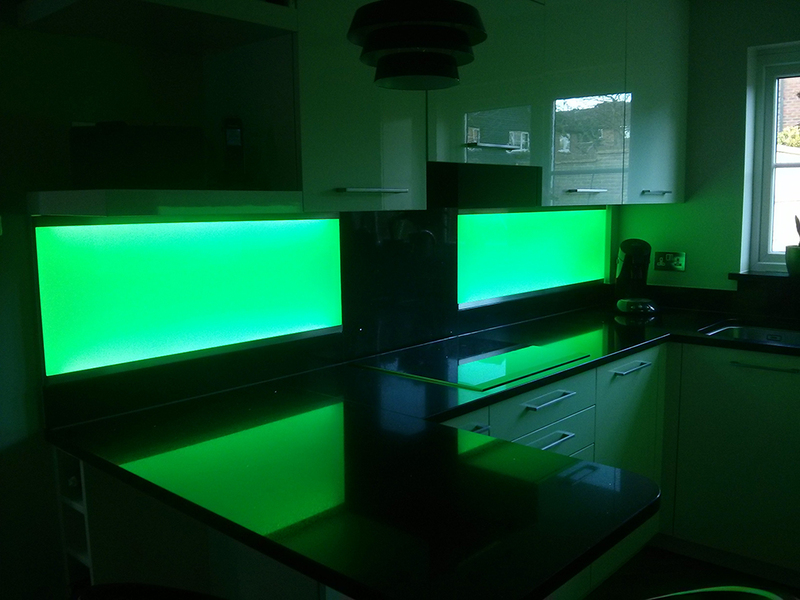 Our client contacted us directly – he was refurbishing his house and had been looking for illuminated splashbacks for some time. 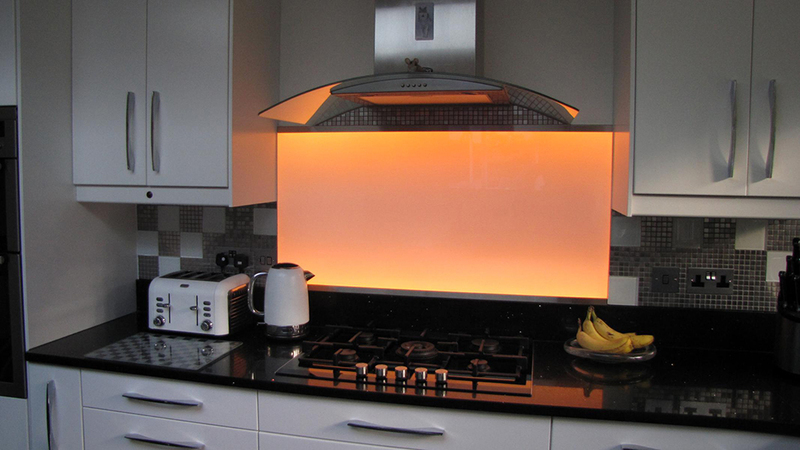 We had several discussions with our client in order to ascertain the best option for him and we then provided a quote for three LiteTile splashbacks. 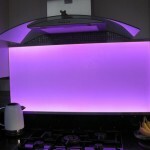 Our client wanted them to form an inverted “T” shape and we explained that we could not produce this as one single splashback but could produce the same effect with three separate ones – however, we pointed out to the client that as the three of the splashbacks were a different height to the one in the middle, there might be a difference in light output. 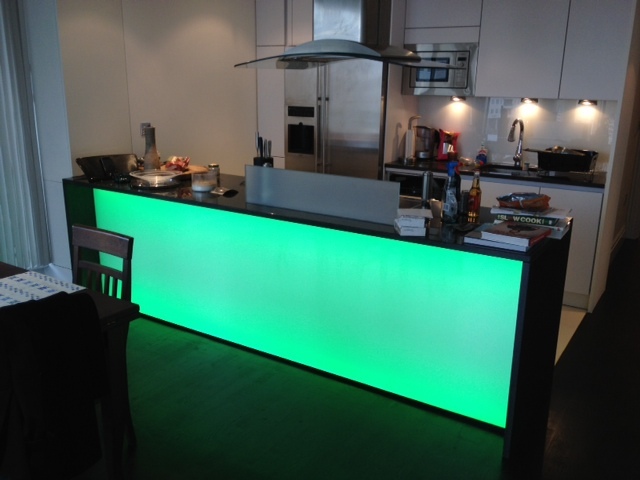 Our client was happy to accept this and placed his order. 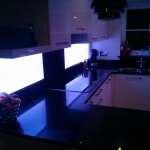 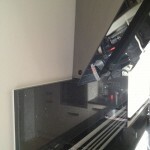 We manufacured his splashbacks and he collected them just before Christmas and installed them within a couple of days. 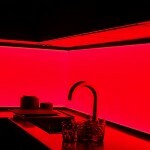 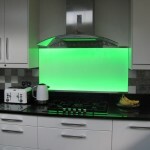 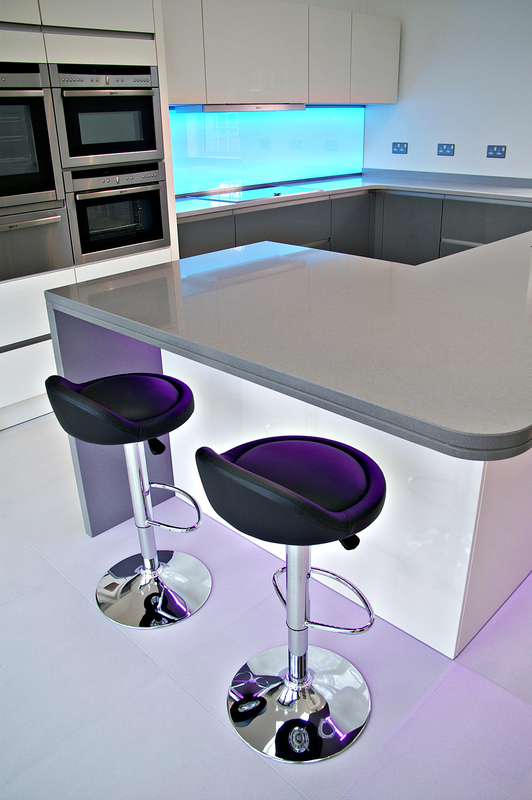 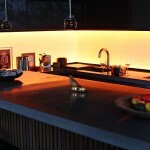 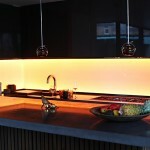 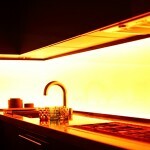 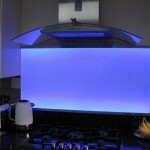 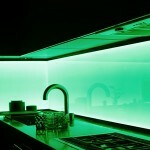 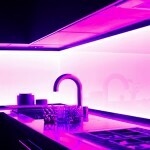 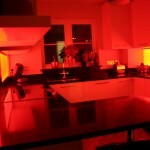 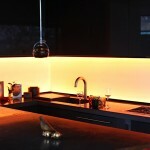 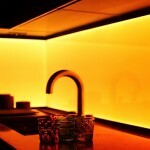 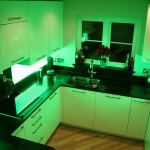 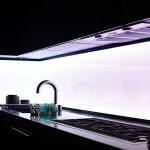 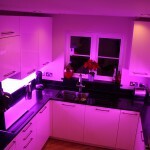 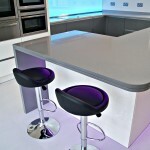 The splashbacks have colour-changing LEDs in them and are controlled by an infra-red remote control unit. 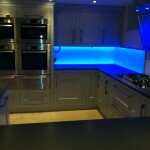 These photos were kindly supplied by our client who says “Our LiteTile splashback has completed our kitchen. 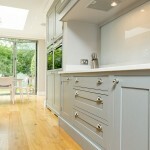 The overall effect is modern contemporary, so easy to clean and looks amazing. 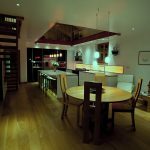 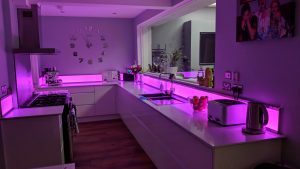 The different lighting options really transform the moods in the kitchen from subtle background lighting to party mode – creating much discussions and sense of wow! 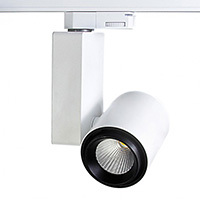 Definitely recommend the products and the customer service!”. 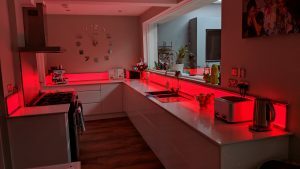 Our client was having a new kitchen extension built at the back of his house and had been looking for something unusual for his kitchen for a while. 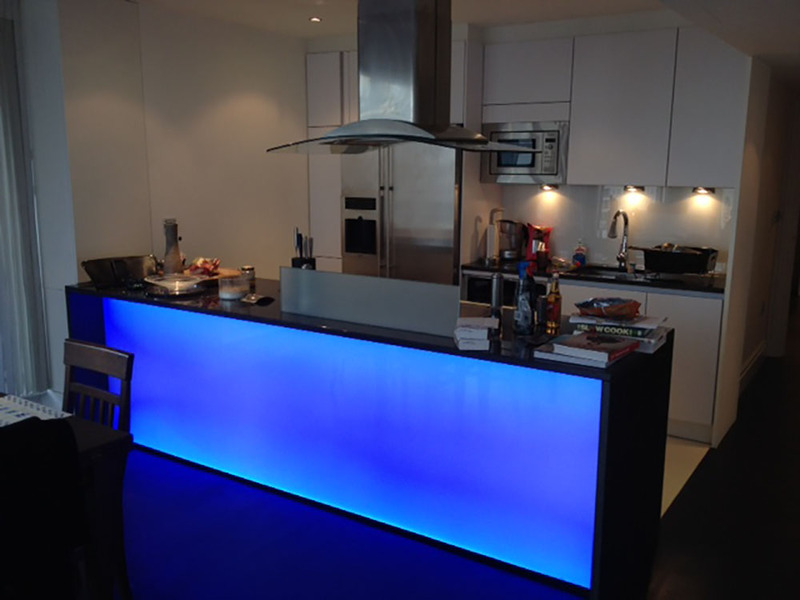 After a discussion with us about the product, installation, electrical requirements etc we provided a quote and the client placed his order. 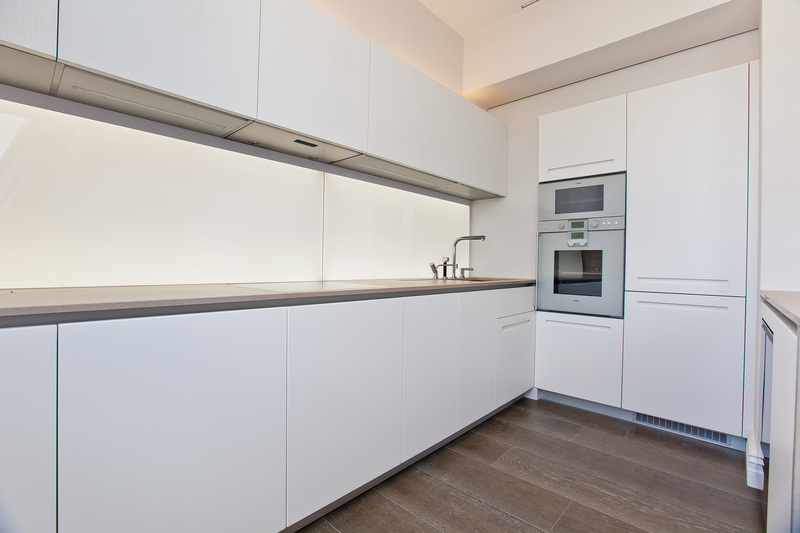 During conversations with our client, we discovered that he wanted a couple of pieces of stainless steel to fit in between two appliances as his kitchen company were not able to provide this. 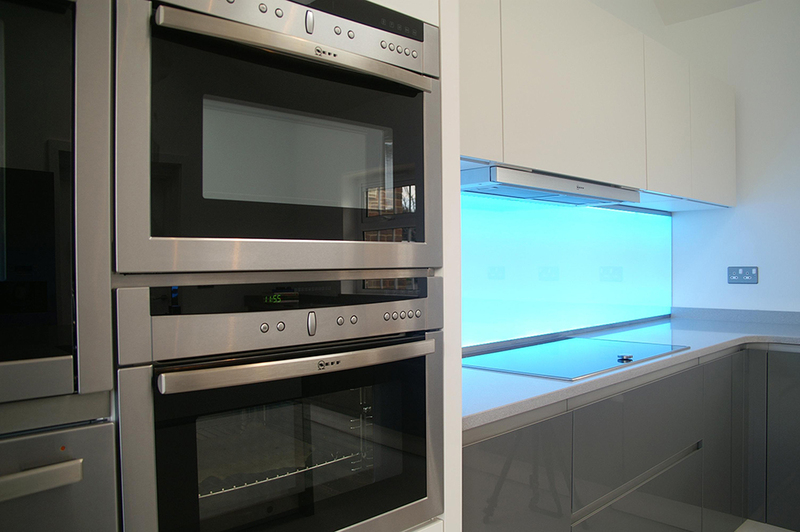 As we use brushed stainless steel frames for our splashbacks, this was not a problem for us and so we also provided this for our client as it matches the frames of our splashback and all his other appliances. 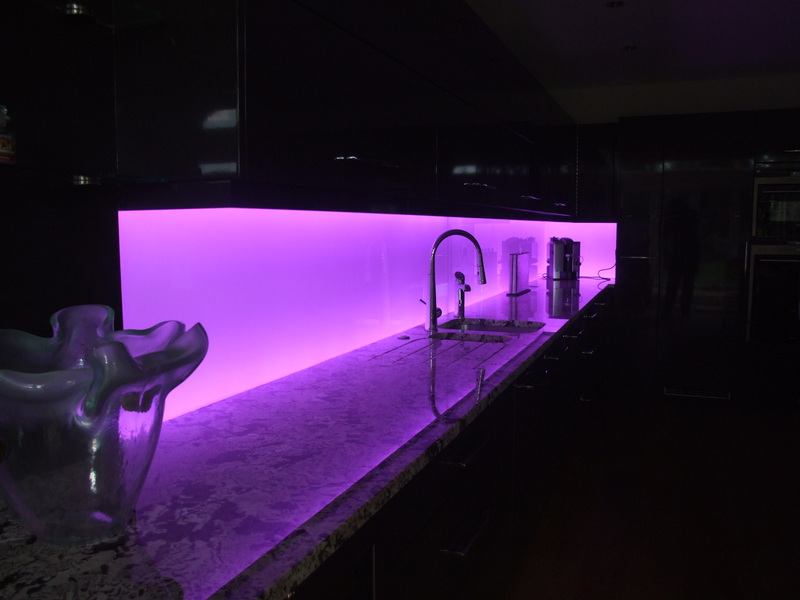 This LiteTile splashback has colour-changing LEDs in it and these are controlled by an infra-red remote colour control unit. 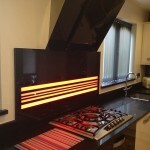 The images (taken by our client) show the LiteTile splashback installed behind the hob with ceramic tiles either side of it. 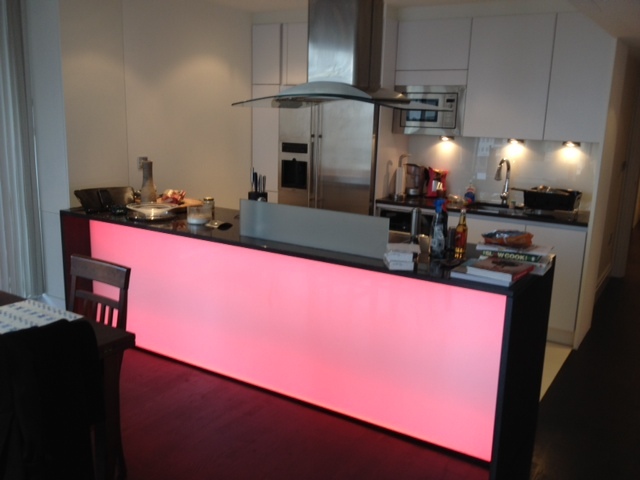 Our client found our website and visited our offices for a LiteTile demonstration. 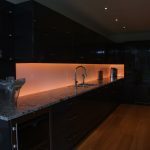 He was in the process of having a large, new kitchen installed in his house and was looking for a different type of splashback for this kitchen. 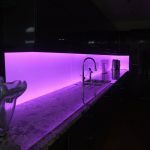 Once he had seen our splashback in action he realised straightaway that he had found exactly what he had been looking for and placed an order. 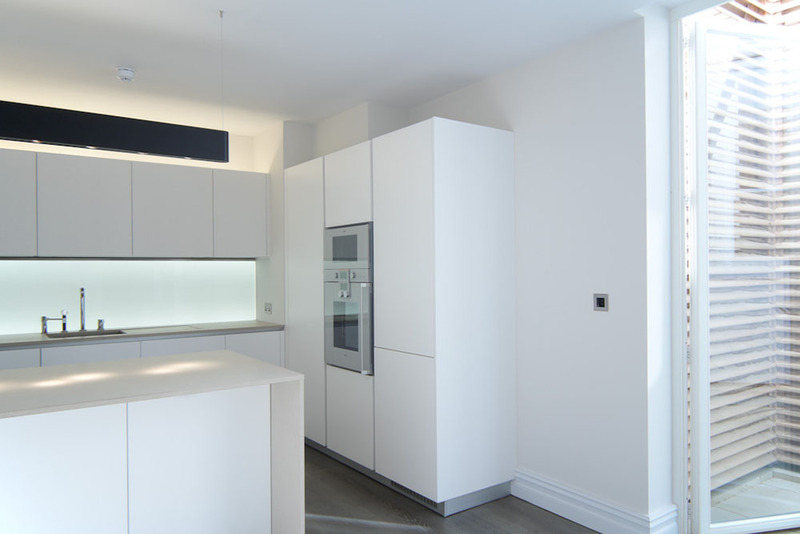 As the kitchen was so large we had to produce three splashbacks – two running along one wall and a smaller one running along the adjacent wall. 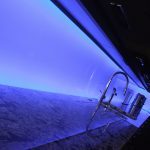 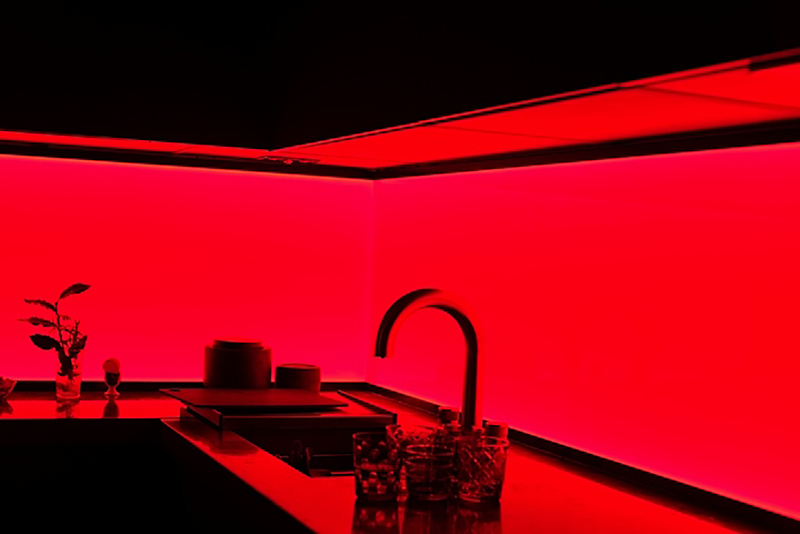 All the splashbacks have colour-changing LEDs in them and are controlled from the same infra-red control unit installed in the kick stripe and change colour or stay on the same colour at the same time. 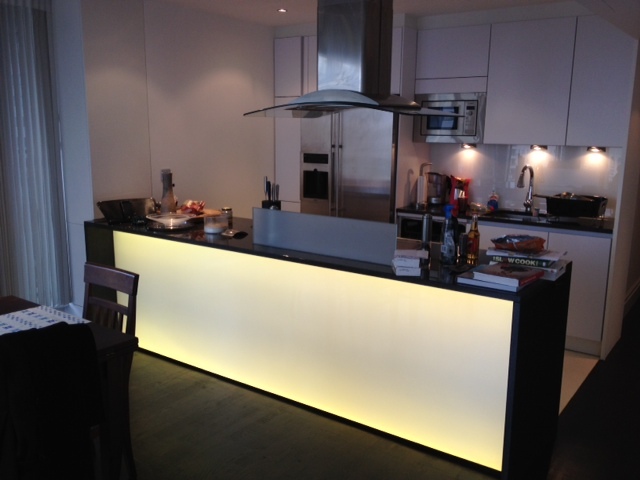 Our client decided to use our installation service and installation took a couple of days. 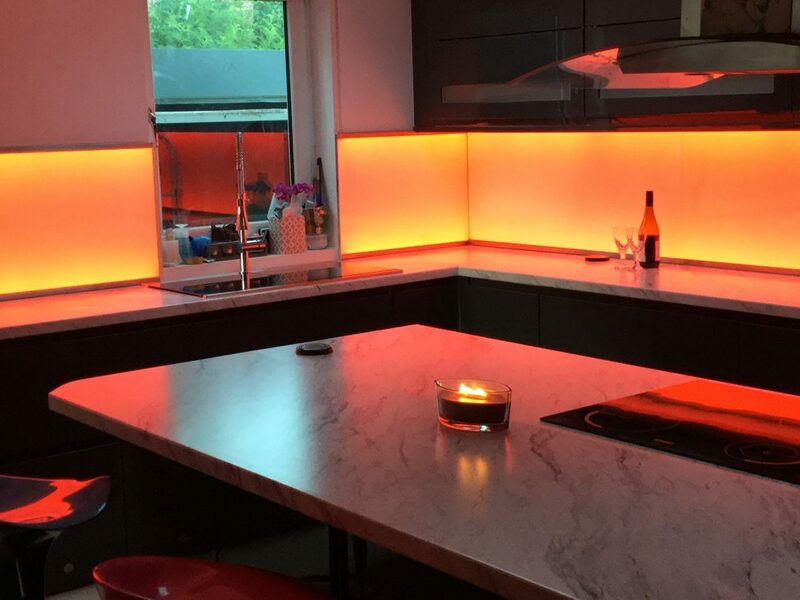 After installation, our client told us that “the LiteTiles add a whole new dimension to the room and not only do they provide excellent task lighting, but they are also a striking feature to have in the kitchen”. 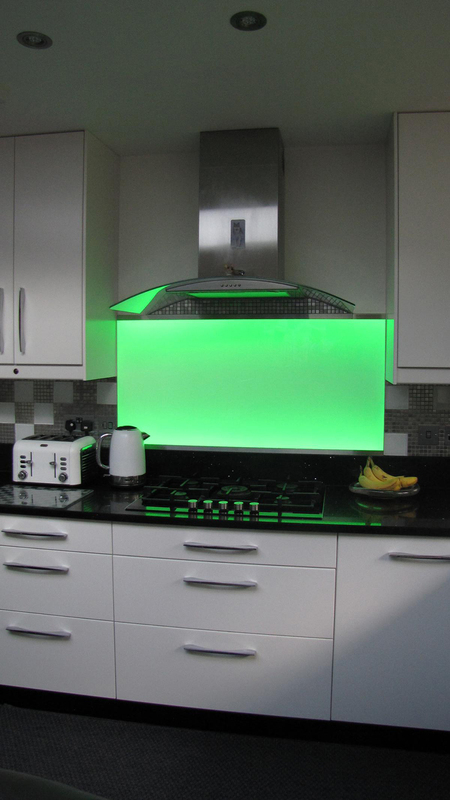 Having discovered our website, our client contacted us directly to discuss the possibility of having iluminated splashbacks in his new kitchen. He had spent some considerable time looking for a supplier who could design and install the idea he had had for illuminated splashbacks and was very pleased to find that we built bespoke splashbacks to meet people’s exact requiremnets. 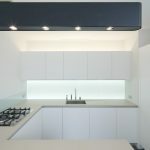 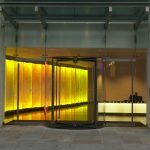 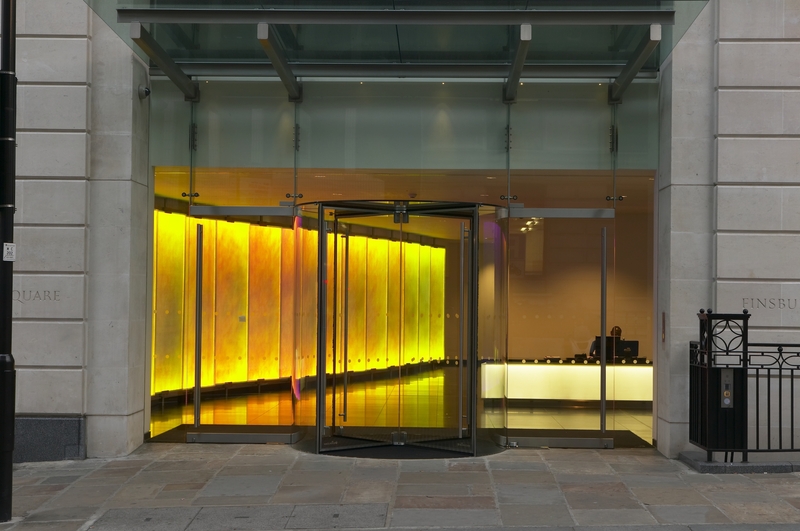 As our client wanted to make absolutely sure he was getting exactly what he envisaged, we had several discussions with him about light dissipation, heat-sinking, water-proofing, transparency, control options, power requirements and installation. 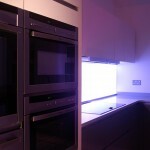 Having had all his queries answered, our client waited until his new kitchen had been installed (with power cables etc. 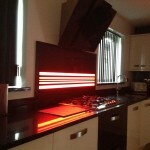 being left in agreed places) and then he measured the dimensions of the splashbacks required and we provided a quote. 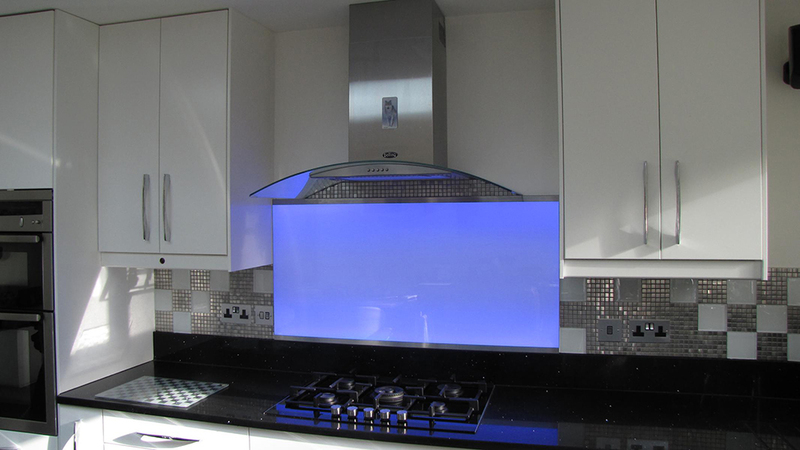 Our client decided to have thee LiteTile splashbacks in his kitchen – with a different type of splashback behind the hob. As can be seen from these images kindly sent to us by our client, the LiteTiles have been installed on top of the upstand – as our splashbacks measure just 20mm in depth they are ideal to be installed on top of an upstand. 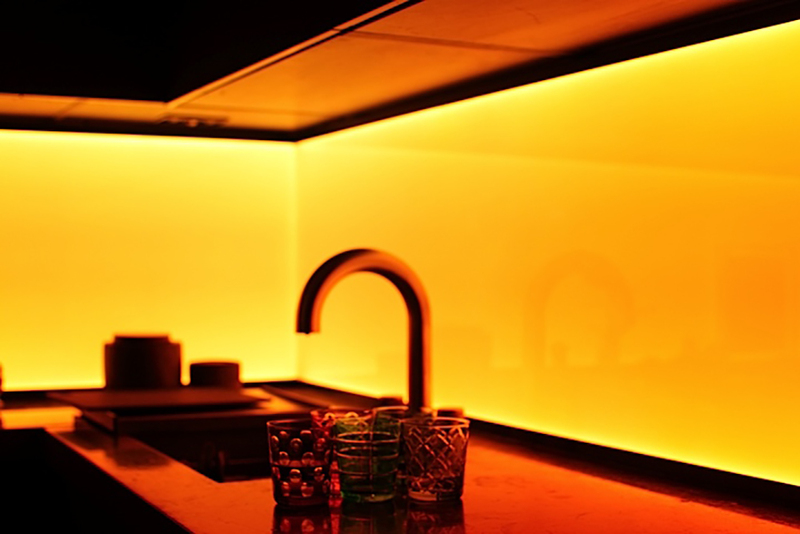 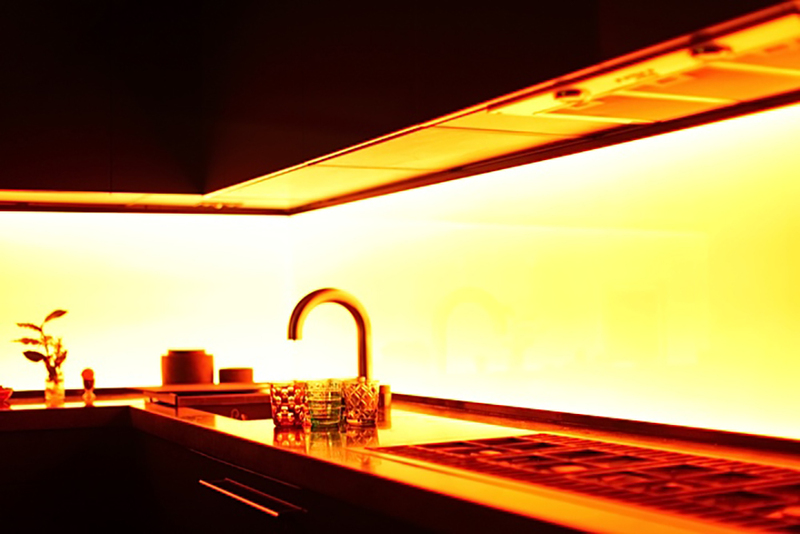 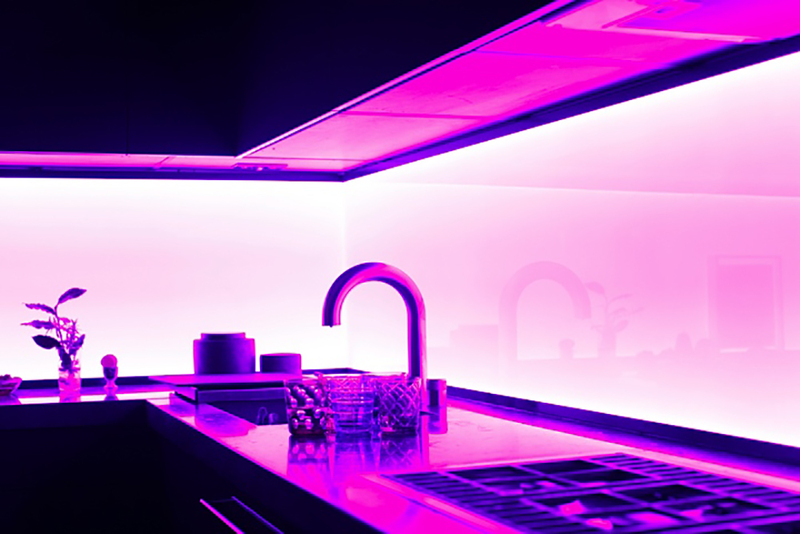 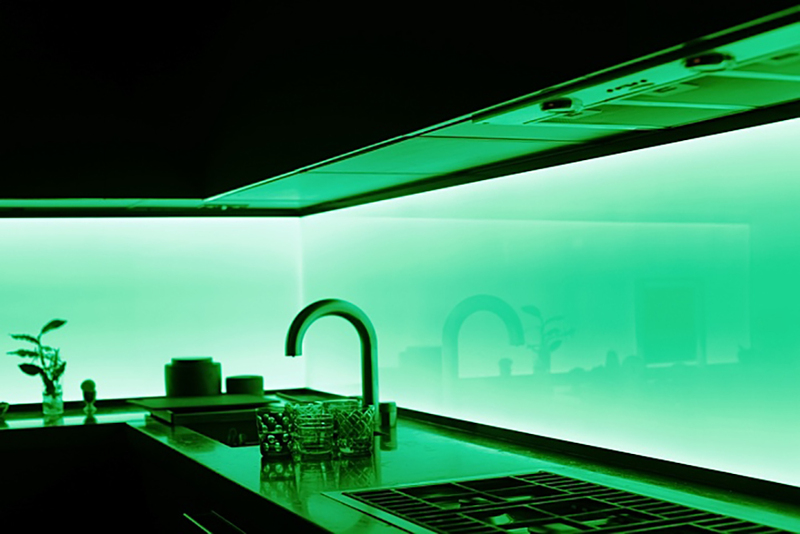 All the splashbacks have colour-changing LEDs in them and are controlled from the same infra-red control unit and change colour or stay on the same colour at the same time. All three splashbacks produce a stunning effect in our client’s kitchen and he is thrilled with the result as this was exactly what he had been looking for. 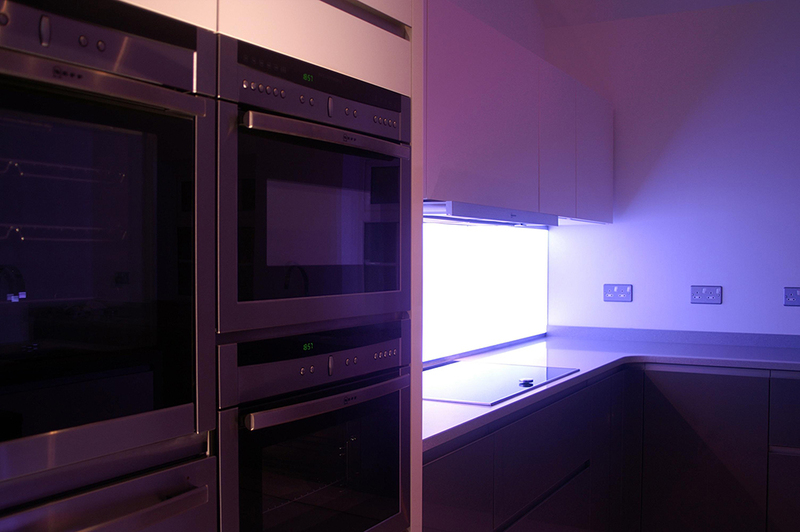 A London-based construction and refurbishment company contacted us as their client was interested in having a LiteTile unit. 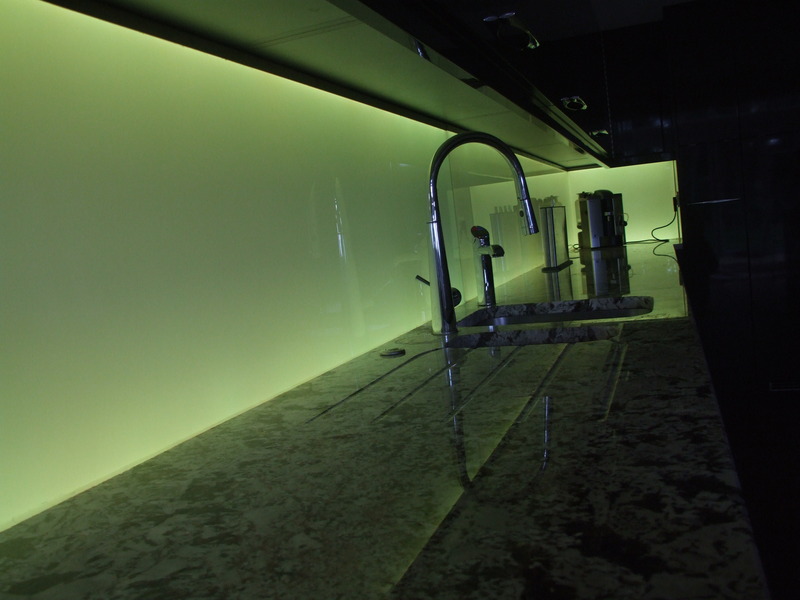 However, their client did not want to use the LiteTile as as a splashback – they wanted it to be installed in the front of a breakfast bar. 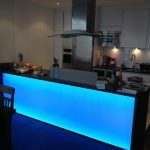 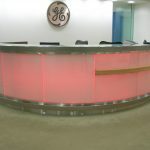 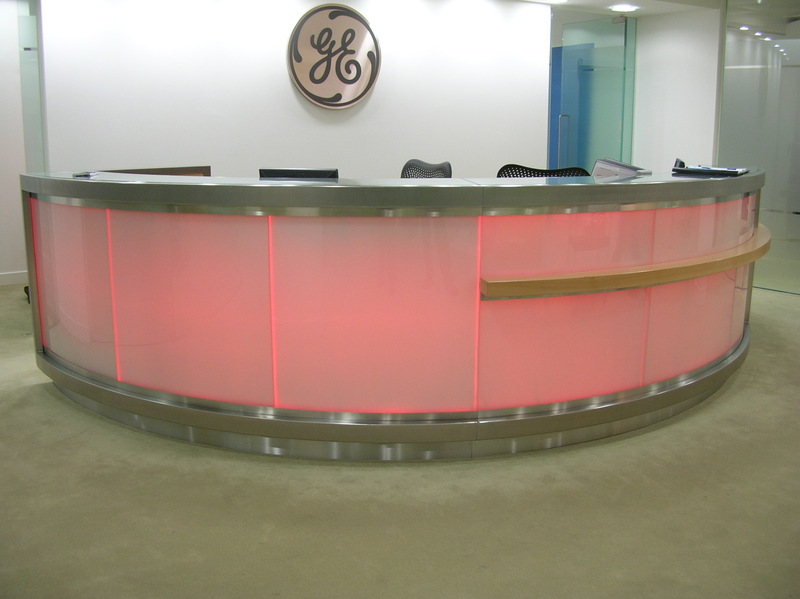 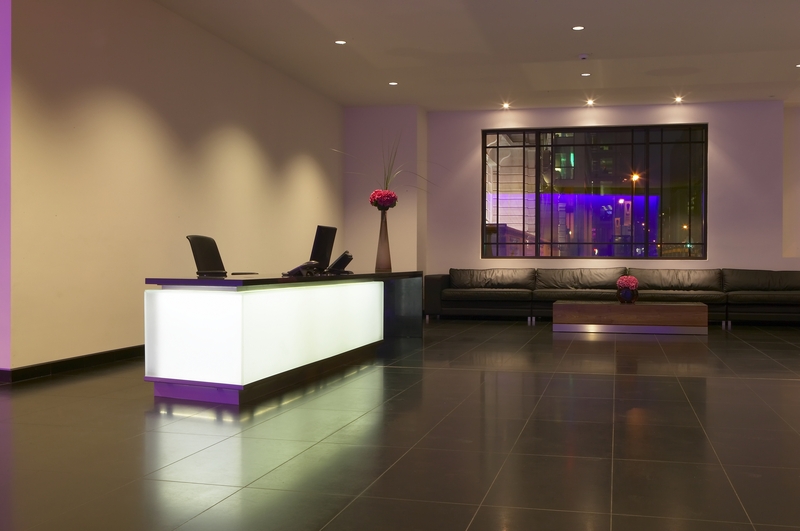 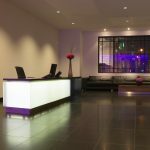 We provided a quote for a LiteTile unit with single colour LEDs and one also with colour-changing LEDs as the client was not sure, at that time, what they wanted. 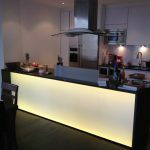 After several telephone calls and discussions with the construction company, we provided another quote for a larger LiteTile unit measuring nearly 3m long and nearly 1m high. 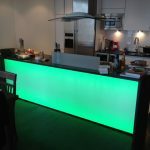 Their client was happy with the quote and we received their order. 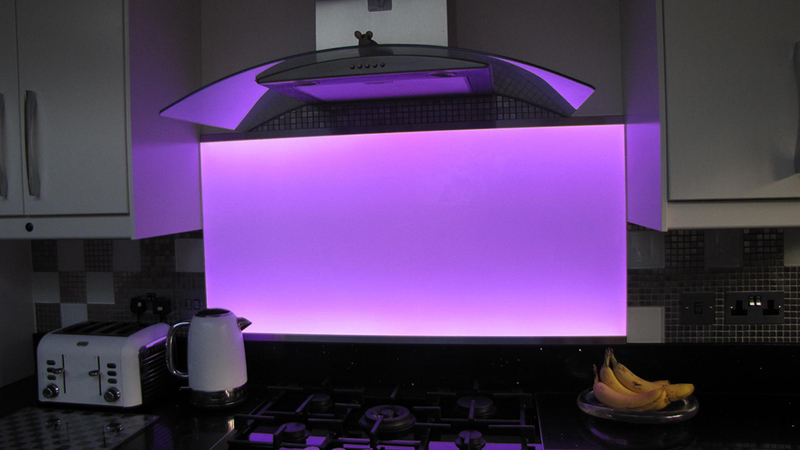 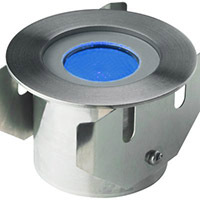 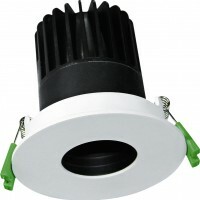 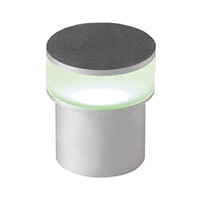 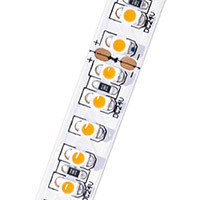 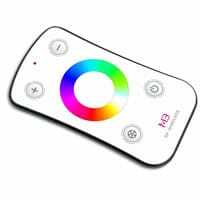 The LiteTile unit has colour-changing LEDs in it and is controlled by an infra-red remote colour control unit. 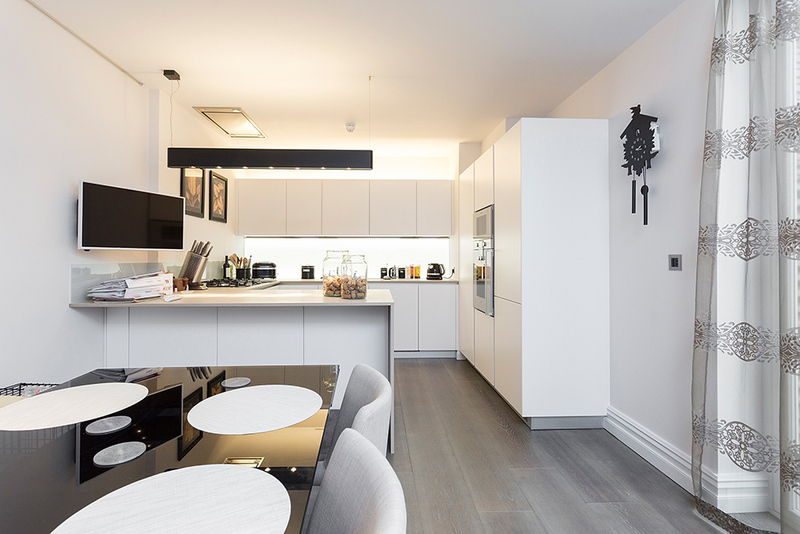 The client also wanted to have the frames painted black – which is not a problem as our frames can be painted to match any RAL or Pantone colour if required). 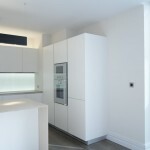 The LiteTile panel was being installed in a flat so we had to ensure that access did not cause a problem on the day of delivery, but the end result is a wonderful feature in this new kitchen and these photos taken by our client during installation show what a great feature a LiteTile can be in a kitchen.